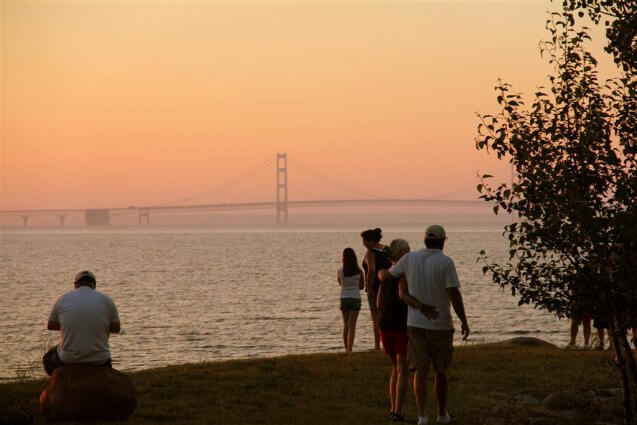 Browse the nearly 200 photos below to get a "virtual expeience" of staying at the campground and enjoying some of what the Mackinaw area has to offer. 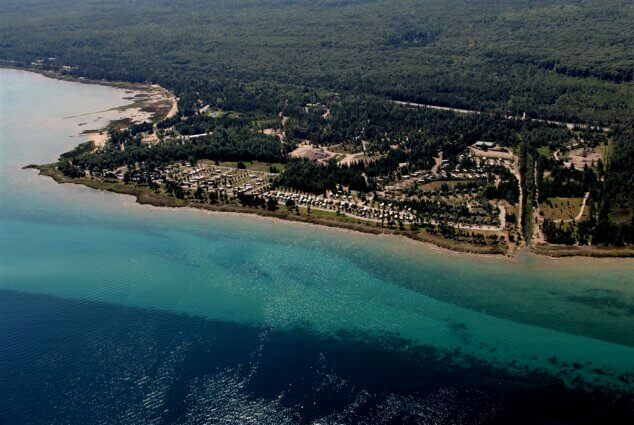 Bird's-eye view of Mackinaw Mill Creek Camping and it's 1 mile of shoreline on the Straits of Mackinac. Located 2 1/2 miles south of the Mackinac Bridge on US Highway 23, the camp was built and is still operating today by the Rogala family. Here is the campground from an onshore point of view. Notice the crystal clear waters of Lake Huron. 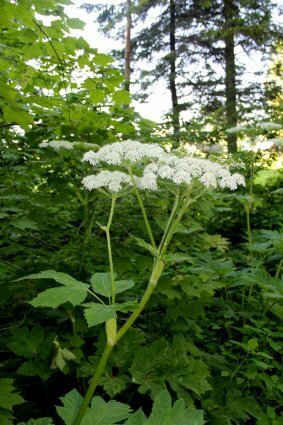 Mackinaw Mill Creek Camping is surrounded by miles of state wilderness and is only a few hundred feet north of Mill Creek Discovery Park. Photo of a Labor Day family reunion that has become this family's tradition. 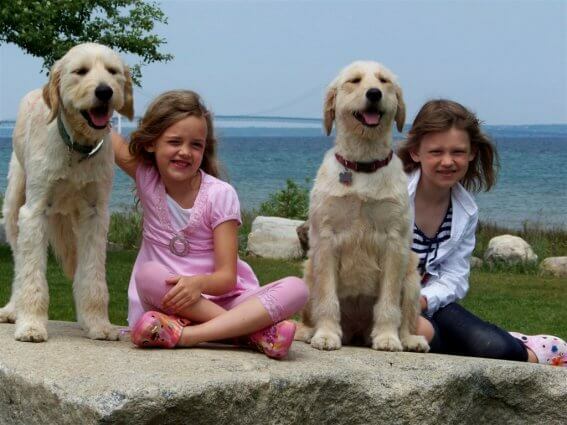 The children of this family now bring their children to experience the Mackinac Bridge walk every year while RVing at Mackinaw Mill Creek Camping. 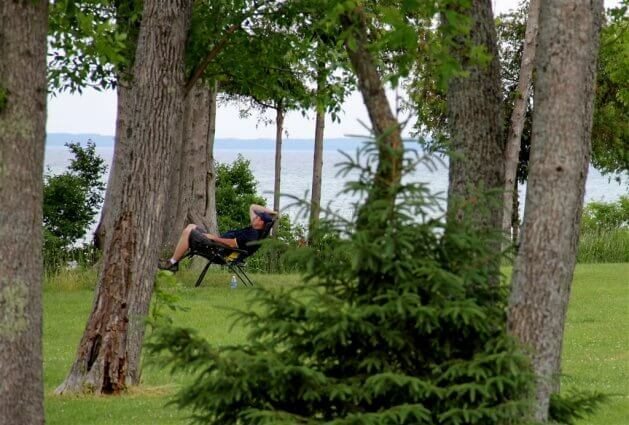 A camper enjoys one of Mackinaw Mill Creek Camping's scenic views that are on one of the many miles of trails and roads inside the 200 acre park. 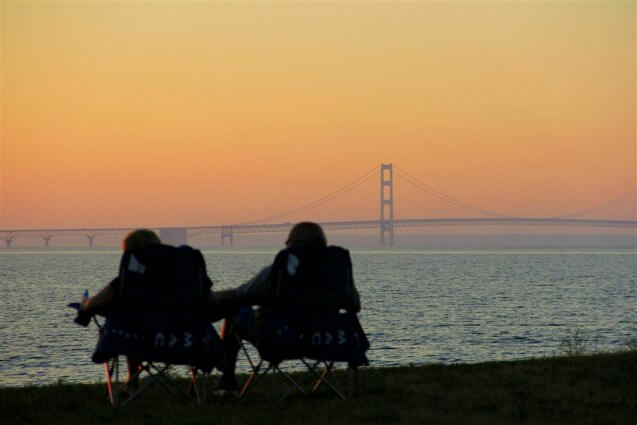 The sun sets behind the Mackinac Bridge and a camping couple at Mackinaw Mill Creek Camping enjoys the million dollar view. 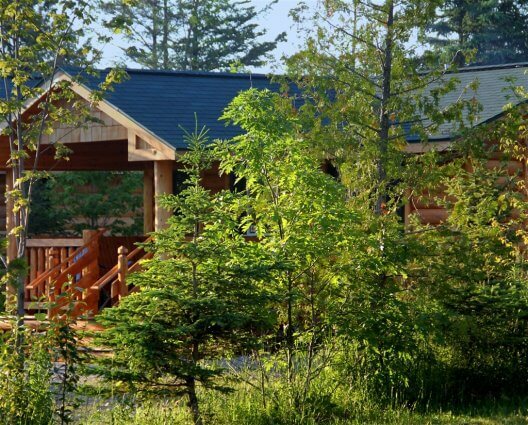 A view of some of the newest cabins in the park, our four person cabins. These cabins have the distinction of being the newest and oldest cabins in the park. Completely restored from the ground up, these cabins originally were built before the age of automobiles. 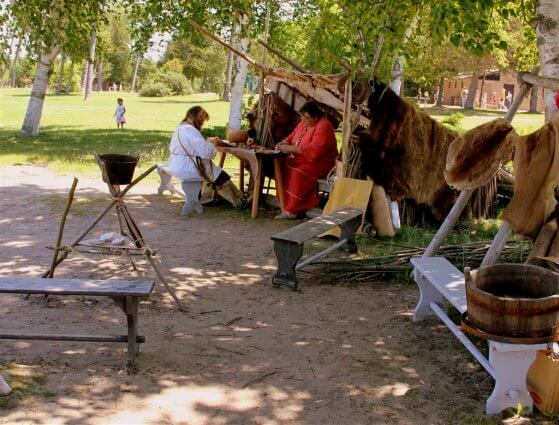 The original structures still had remnants of a stall where you would put your horse for the night. Originally constructed and situated near Mackinaw City's state dock, in recent years they were situated near Nicollet Street. Slated for demolition, the Rogala family decided to restore and preserve this part of Mackinaw's heritage and make them part of Mackinaw Mill Creek Camping's history. 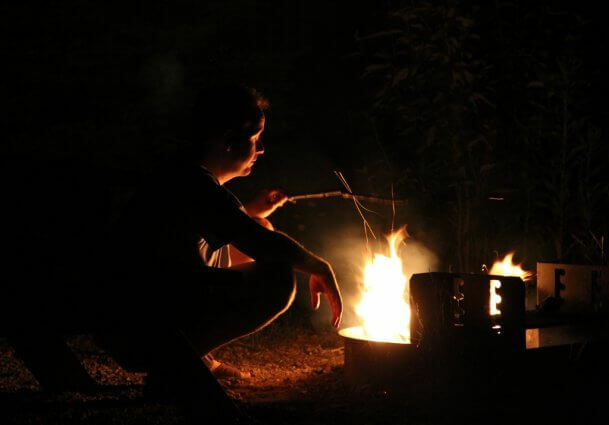 A cabin camper partakes one of the joys of camping, a campfire. The campground's cabins have stationary fire rings. However, many of the campsites allow portable fire pans to be used where ever you would like on your site. Along with allowing you to put your fire where you want it, this also allows sites to be completely clean from campfire waste (campers keep your fire waste in specially labeled garbage cans throughout the park). 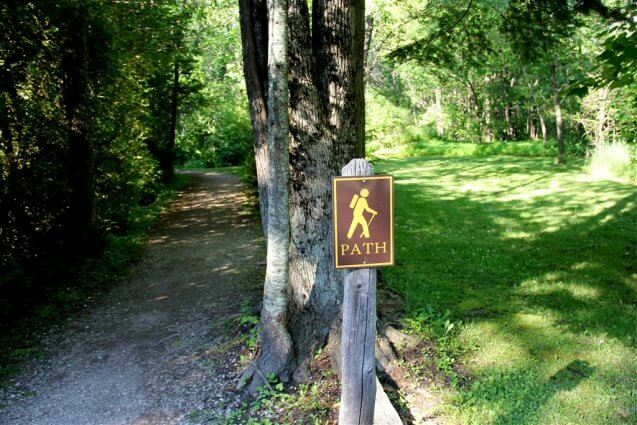 This means, even though the park is situated in the midst of miles of wilderness, there are very few problems with varmints (skunks, raccoons, bears, etc.). 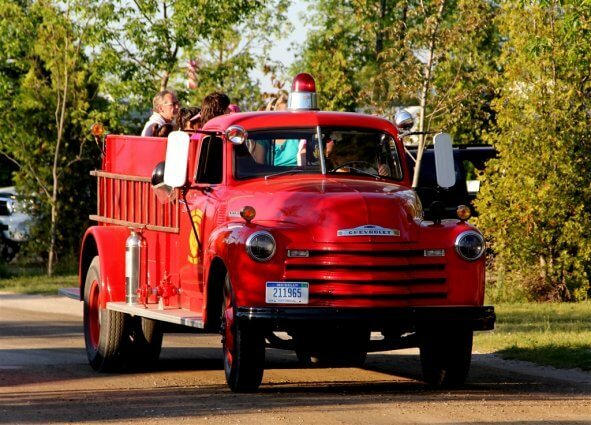 Mackinaw Mill Creek Camping operates a 1940s era fire truck, restored lovingly by the campground staff. 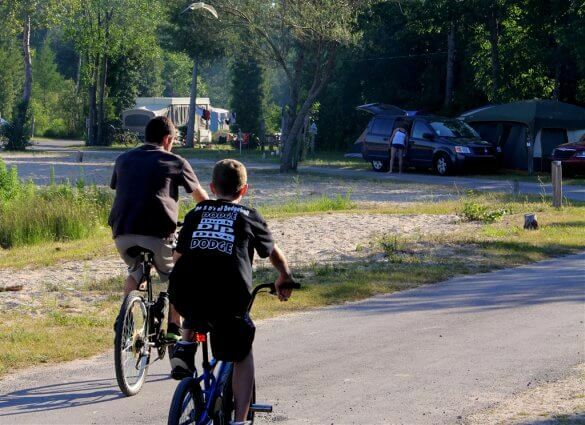 Most evenings, as weather permits, members of the camp staff give rides to campers through the park. Rides are only allowed during daylight hours, so putting off asking for a ride could mean you are stuck with a crying four-year-old if you don't catch the truck until it's time to put it up for the evening. 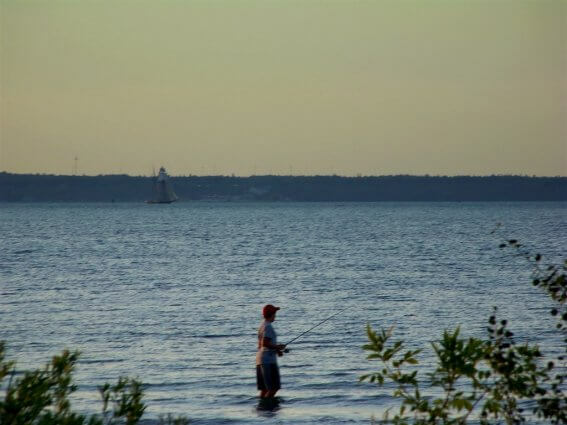 A schooner passes in the background as a young man fishes of the shore of Mackinaw Mill Creek Camping. 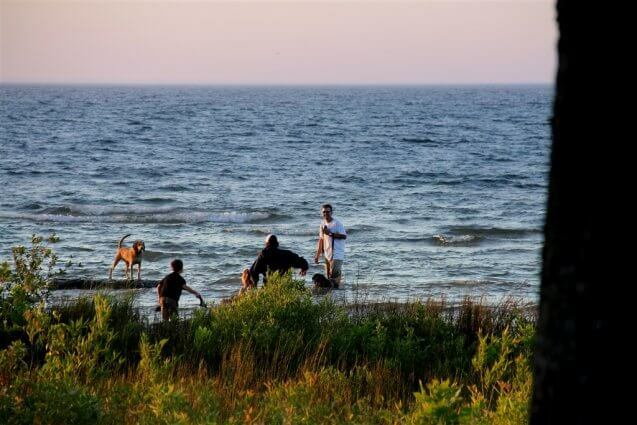 There are many renowned fishing spots in northern Michigan, however, that doesn't stop the adventurous from trying their luck in the crystal blue waters of shores of the Park. 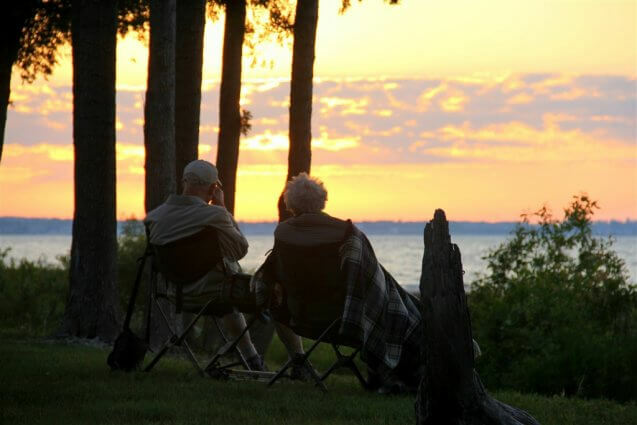 Though many campers try, fishing off the coast of Mackinaw Mill Creek is nothing compared to the wonderful fishing found nearby at the Cheyboygan River, Waugoshance Point or the Carp River. We recommend checking with Coffman Hardware in Mackinaw City (where fishing licenses are sold) to find out where fish are biting. 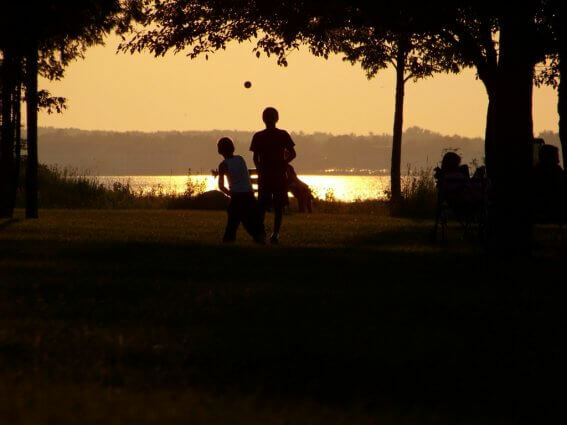 Children enjoy long hours of daylight typical for Mackinaw during June and July. 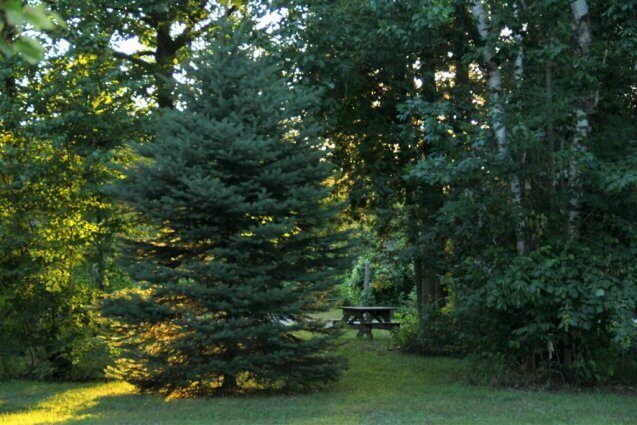 Its northern location gives Mackinaw Mill Creek Camping's guests hours of extra sunlight every day. Some nights it is nearly 10pm before it truly gets dark. 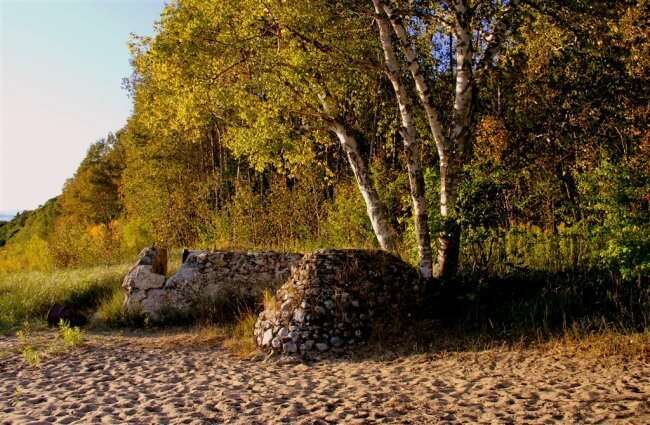 Mackinaw Mill Creek Camping was originally designed and constructed during the 60s and 70s. However, conventional wisdom at the time (remember the original gas crisis in the 1970s) did not take into account that vehicles would find a way to get larger, regardless of the increase in fuel costs. 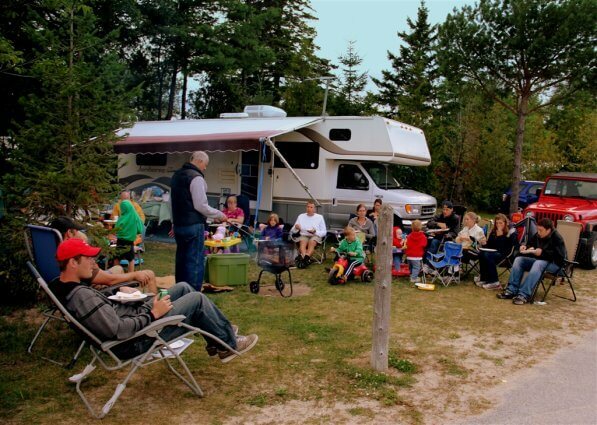 To accommodate these larger camping vehicles, the Rogala family, starting nearly 10 years ago, in the off-season has been enlarging their campsites. Dozens and dozens of sites are made larger each season. 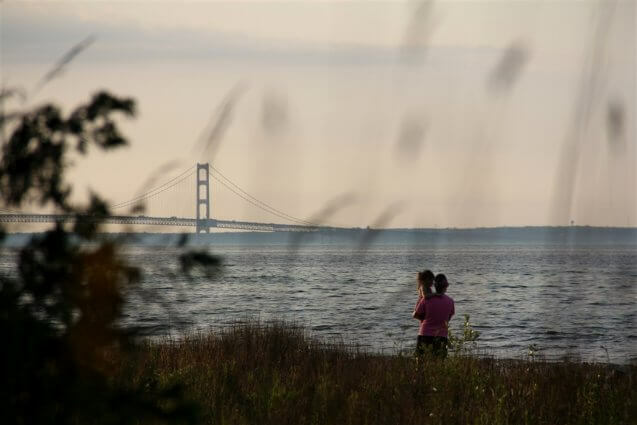 Remaining smaller sites are now rented for "supersaver" prices, which allow most anyone to be able to afford a Mackinaw vacation. This is a photo of an enlarged big rig site. 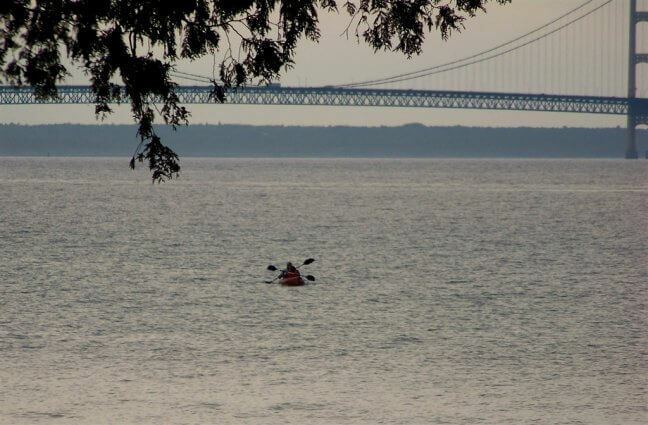 Campers kayaking from the shores of Mackinaw Mill Creek Camping amidst the breathtaking majesty of the mighty Mackinac Bridge. These Campers appear to be headed for the campgrounds heated pool (open Memorial Day through Labor Day). 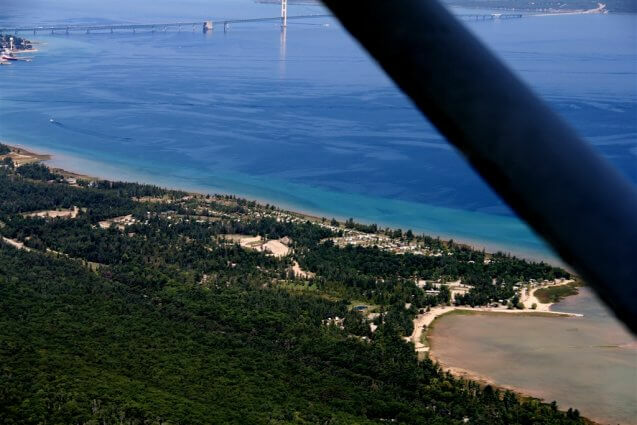 Camped on the shores of Lake Huron, their campsites have a view of Mackinaw City, Mackinac Bridge, St. Ignace, Round Island, and as seen here, Bois Blanc Island. 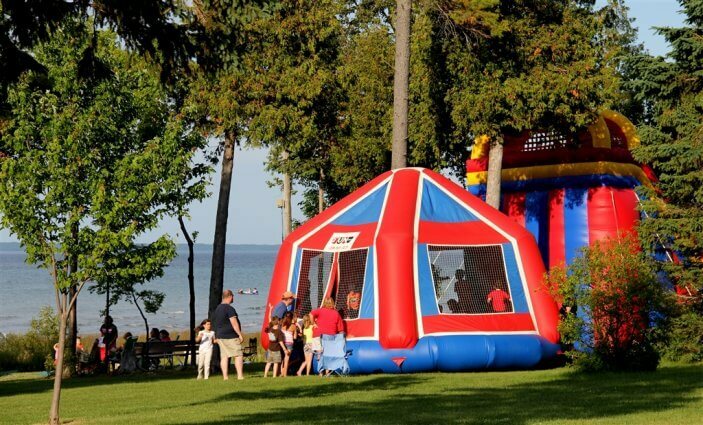 Special events sometimes bring "bounce houses" to Mackinaw Mill Creek Camping as was the case this Fourth of July. You can already see people with easy chairs lining up for a spot for the fireworks. 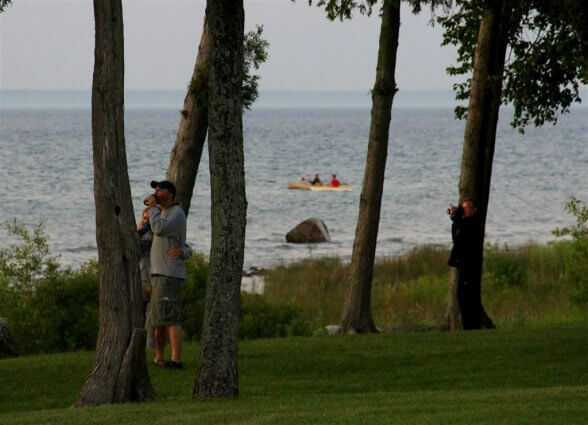 Our guests enjoy seeing fireworks from three locations over the lake. 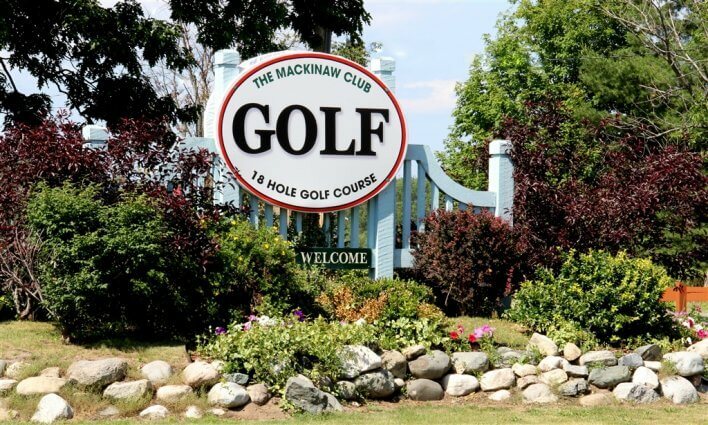 Mackinaw Mill Creek Camping offers incredible discounts to its guests for the 18-hole, Mackinaw Club golf course. 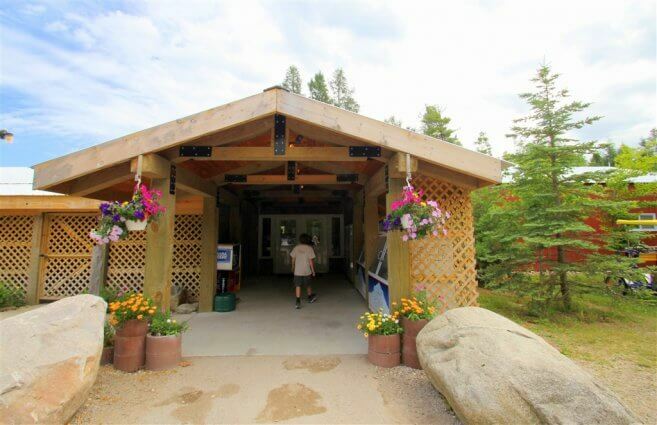 The camp also features a well-appointed park store (open Memorial Day through Labor Day) and Wi-Fi* Internet (*click for more info) is available through much of the park. Camper enjoying a sunset from the shore of Mackinaw Mill Creek Camping. One of the best places to photograph the Mackinac Bridge and Mackinac Island is from the shores of the camp. 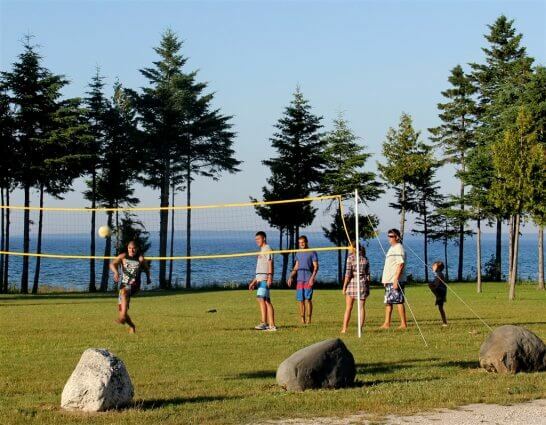 These Mackinac Bridge View cabin campers brought their own volleyball net and enjoy a spirited game on the shore of Lake Huron with the Mackinac Bridge as a backdrop. 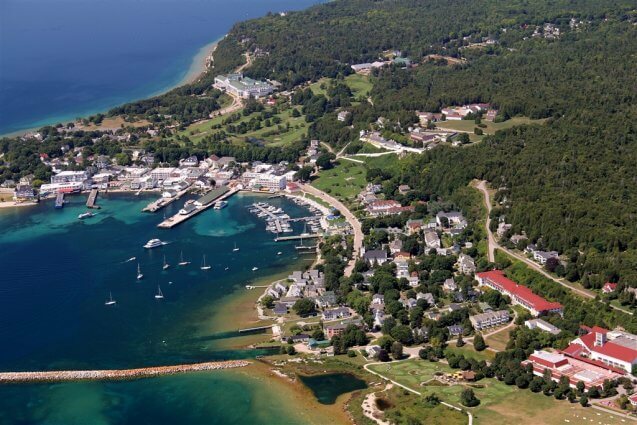 No trip to Mackinaw is complete without a trip to Mackinac Island. 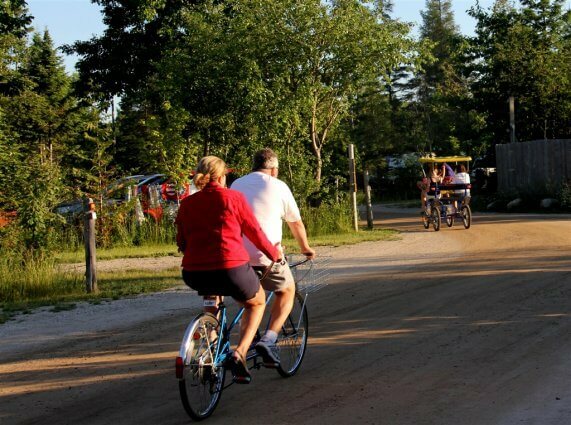 Mackinaw Mill Creek Camping offers its guests discounted ferry passes and a free shuttle to the docks. 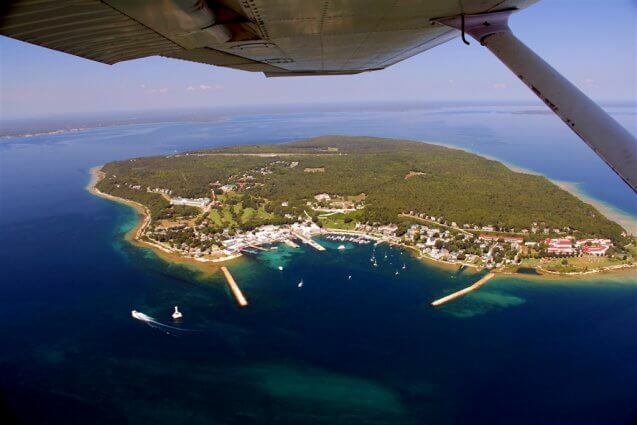 Mackinac Island from a bird's-eye view (or in this case a single engine plane) reveals the azure blue, crystal clear waters of Lake Huron. Ferry boats can be seen leaving the harbor. In the distance you can see the Upper Peninsula and the shores of St. Ignace. Here is a photo giving you a closer look of the harbor and downtown of Mackinac Island. Historic Fort Mackinac is visible with the sloping diagonal walkway leading to the fort's entrance. The pool in the foreground also has historic significance and legend has it that at one time, what were then thought to be witches, were drowned here. The Round Island Lighthouse greets visitors to Mackinac Island. This lighthouse was saved by historical societies and the donations from hundreds of people; the lighthouse was reconstructed and restored after falling into structural disrepair. 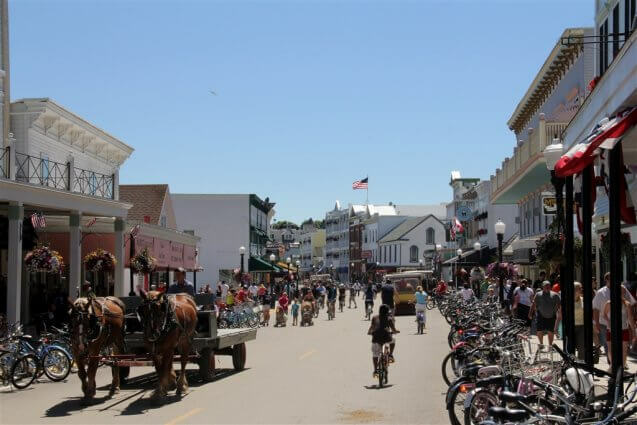 A warm summer day on Main Street of downtown Mackinac Island where no motorized vehicles are allowed, only horses and bicycles. Many of the buildings here date back to late 1700s. Fudge shops, saloons, gift and curiosity stores abound, making it a shopper's delight. 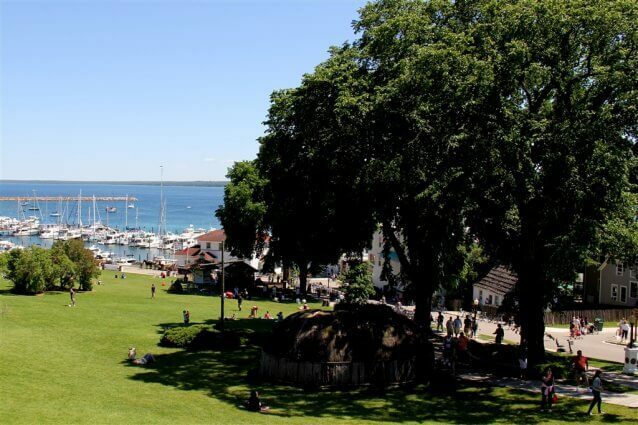 The view from the sloping walkway to Fort Mackinac reveals the reconstruction of the Native American style chapel under the great oak trees and a view of the harbor at Mackinac Island. 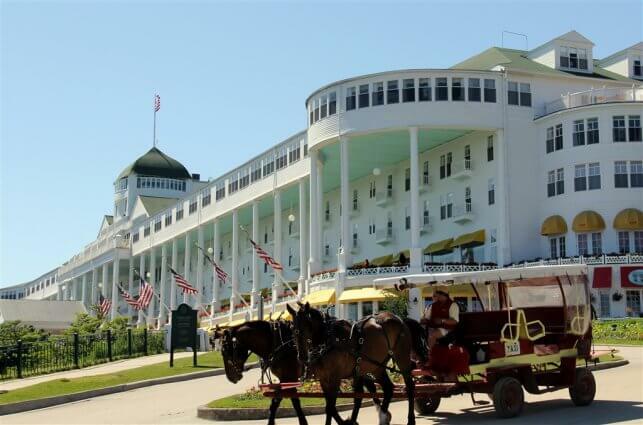 The Grand Hotel features the longest wooden porch of any hotel in the world and was featured in the movie "Somewhere in Time" starring Jane Seymour and Christopher Reeve. A little-known fact, we locals like to bring our swimsuits and pay a small entry fee to use the hotel's beautiful and exquisitely maintained swimming pool. Bicycles are the preferred method of transportation on the island if you don't have a horse handy. 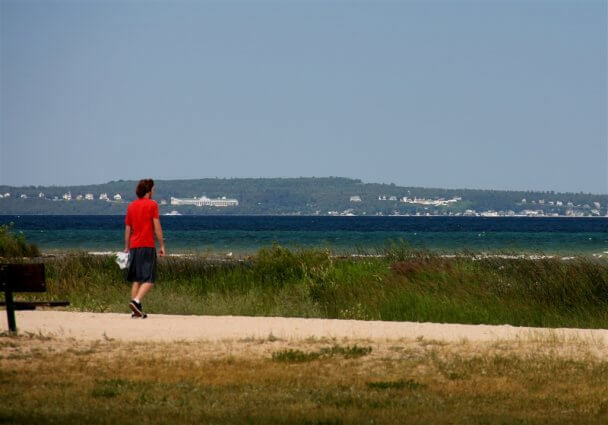 The road rings the shoreline of the island and features vistas like this one where you see the Mackinac Bridge, sailboats and Mackinac Island ferries. Sugar Loaf is a limestone curiosity formed in the same period as the island's "Arch Rock" and is located on its own trail off of the road bisecting the island. The Sugar Loaf rock formation figures in many local Native American traditions and mythologies. 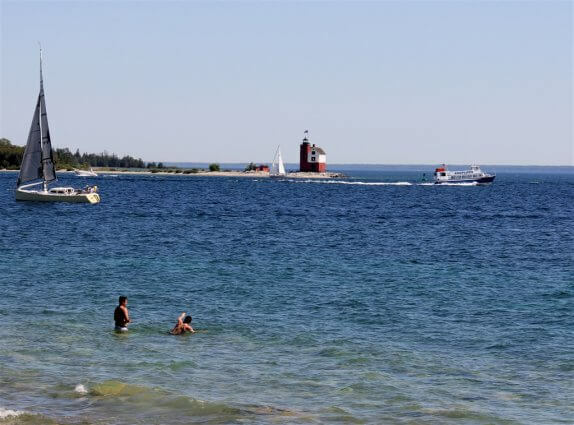 Swimmers brave the brisk Lake Huron waters near the mouth of the Mackinac Island Harbor as sailboats and ferries cross paths in view of the Round Island lighthouse. 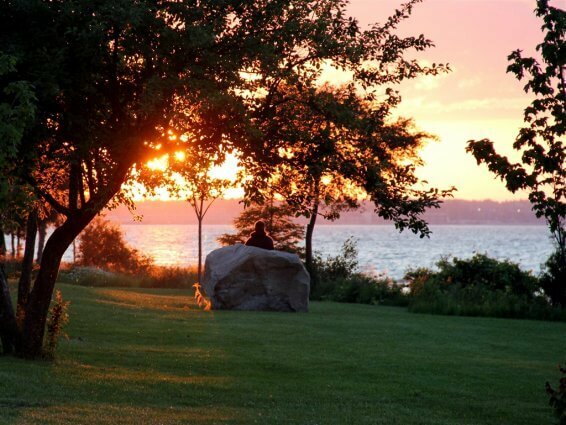 Views like this are not uncommon as gardens from Victorian houses dating from the 1800s line the shores and limestone cliffs of Mackinac Island. 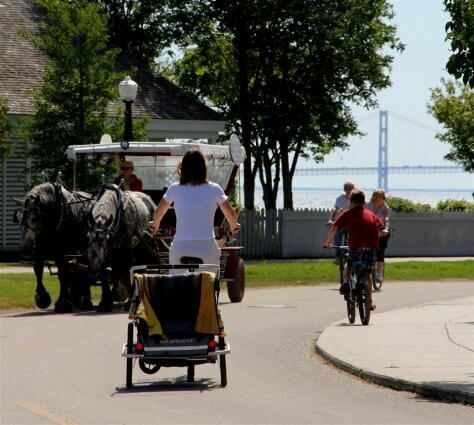 Bicycles and horses are keen on Mackinac Island. 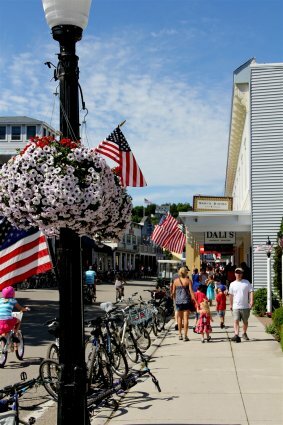 The sidewalks are fragrant with the aroma of world-famous Mackinac Island Fudge. 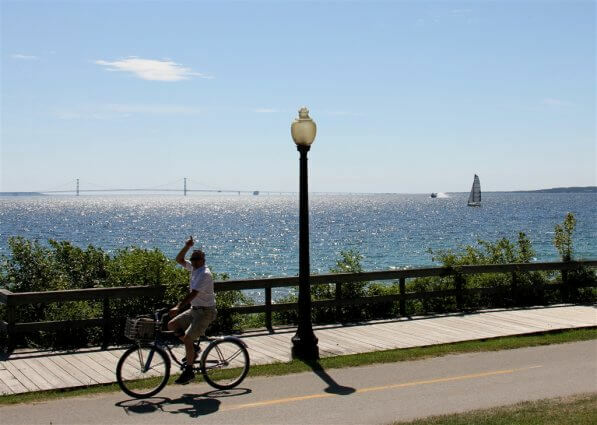 Bicycles and horses share the roadway in what feels like a trip back in time, as modern age looms in the form of the Mackinac Bridge in the distance. Here is a bird's-eye view of a ferry on its way to Mackinac Island as the Mackinac Bridge stands majestic in the distance. The Upper Peninsula is visible in the upper right hand corner of the photo. 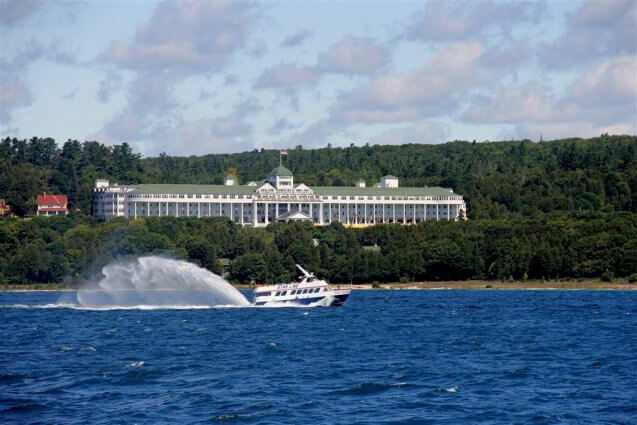 The picturesque Grand Hotel looms behind a Mackinac Island boat ferrying visitors to Mackinac Island. 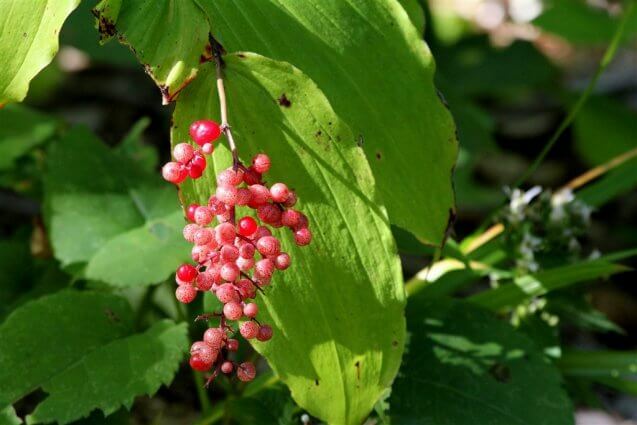 Mackinac Island is a protected state historical preserve featuring many indigenous plant species. 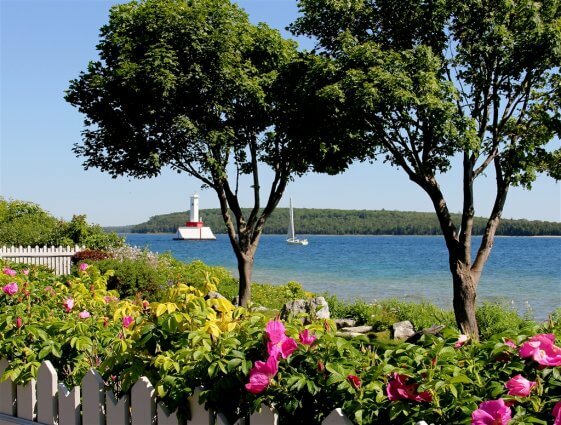 Mackinac Island's wildflowers are in full bloom during the peak summer tourist months. 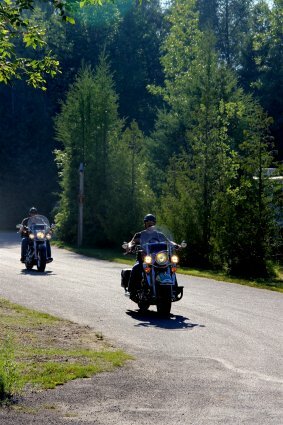 Back on the mainland, a pair of motorcycle campers arrives at Mackinaw Mill Creek Camping. 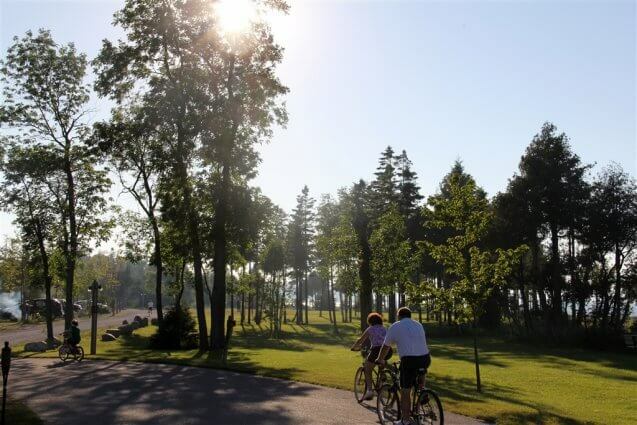 The campground welcomes all types of campers from bicyclists, motorcycles, vans, small tents, and everything in between up to the largest and most luxurious recreational vehicles. Due to an infestation of the Emerald Ash Borer the State of Michigan has made it illegal to transport firewood. Moving firewood is responsible for wiping out many of Michigan's majestic Ash Tree forests. Since nearly 3/4 of the campground is populated with beautiful Ash Trees, the staff is especially careful to educate incoming guests about the threat. Campers who haven't read about the Emerald Ash Borer and who haven't seen the many billboards advertising the ban on moving firewood are asked to leave their firewood at the office and are given replacement local wood. Their wood is then safely disposed of, saving our ash trees and themselves from receiving substantial citations and fines. For more information read our Firewood Policy. 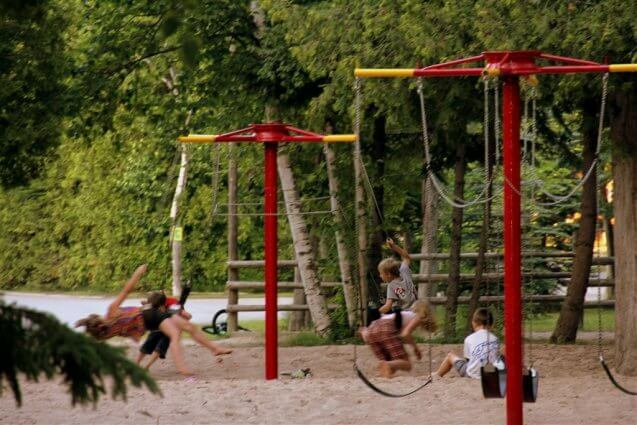 Children play in one of Mackinaw Mill Creek Camping's several playgrounds. 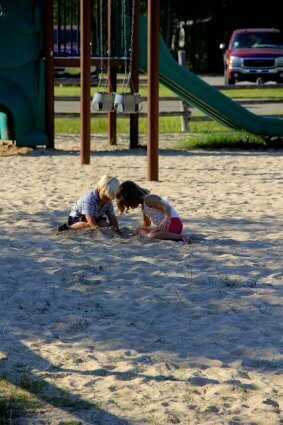 As with children everywhere and throughout time, these little ones find fun in the playground's sand! 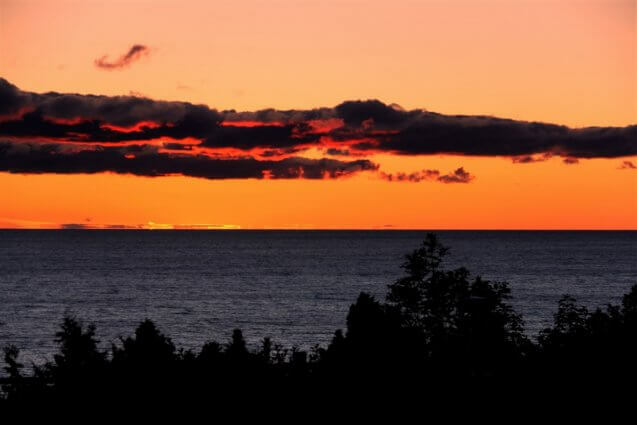 A Mackinaw Mill Creek Camping guest captures another spectacular sunset to share with his friends and family. 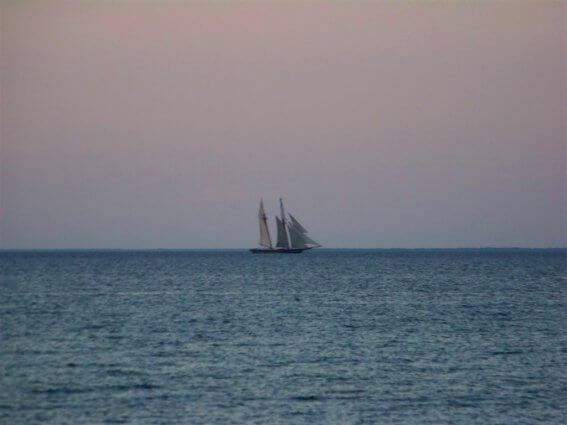 A modern day schooner gives us a feel for what it was like to look out on the lake's hundreds of years ago when the only mode of locomotion was the wind. 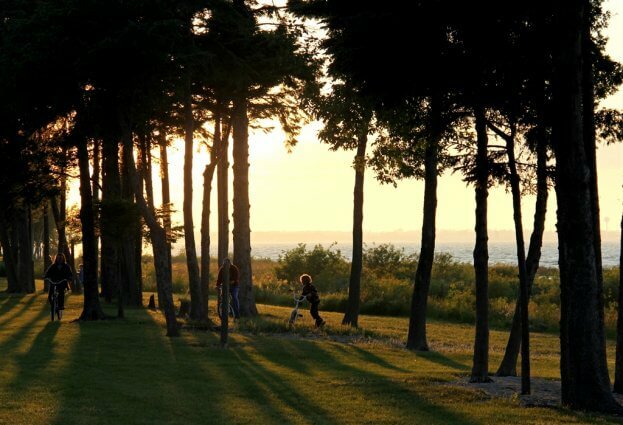 Mackinaw Mill Creek Camping guests enjoy incredible discounts at the camps golf course, the sprawling 310-acre, 18-hole Mackinaw Club Golf Course. 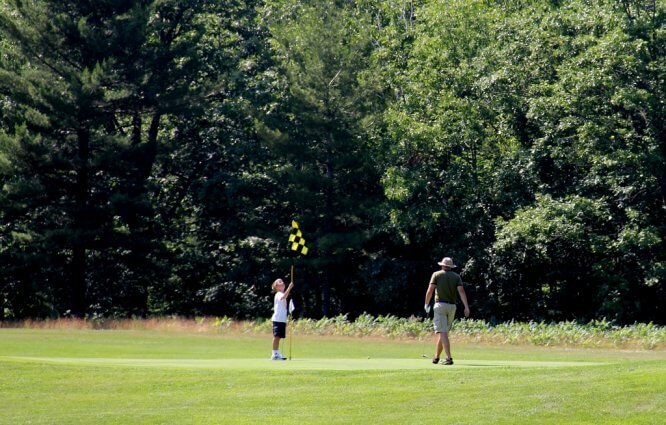 Campers at Mackinaw Mill Creek Camping enjoy great discounts on golf at the camp's 18-hole, Mackinaw Club Golf Course, which spans 310 acres of beautiful northern Michigan forest and meadows. 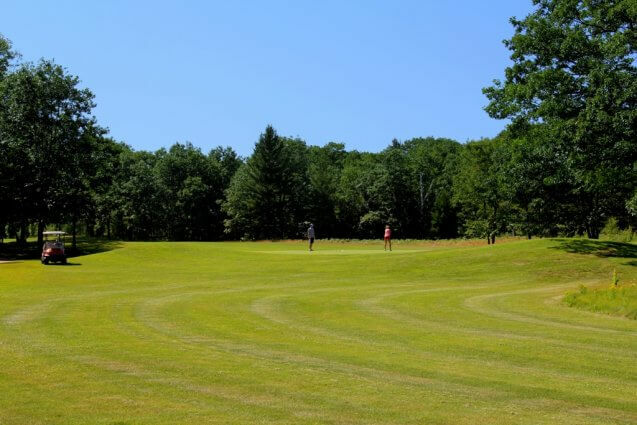 With the new emphasis on turf management, the Mackinaw Club features a uniquely maintained course that is challenging yet designed for playability. Back at the campground, this young man catches a high fly ball on the shores of Lake Huron. 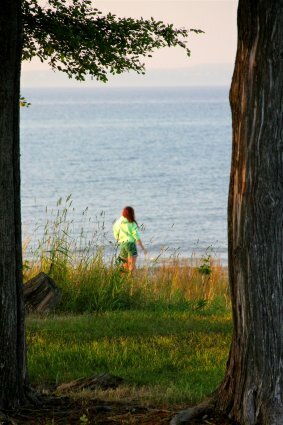 Much of the lake shore at Mackinaw Mill Creek Camping has been preserved as a green area for all campers to share and enjoy. 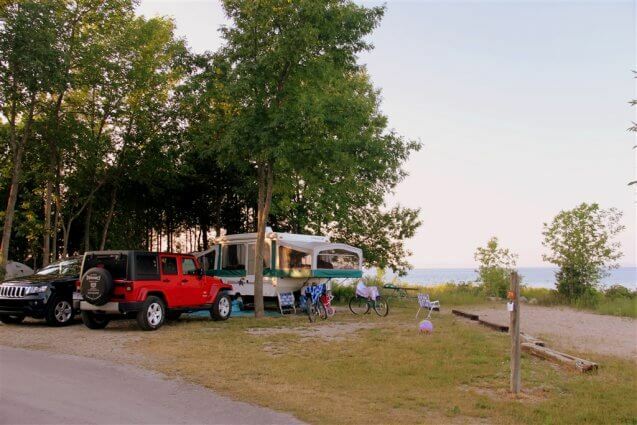 Fourth of July weekend is one of the busiest weekends of the year for any campground and Mackinaw Mill Creek Camping is no exception. 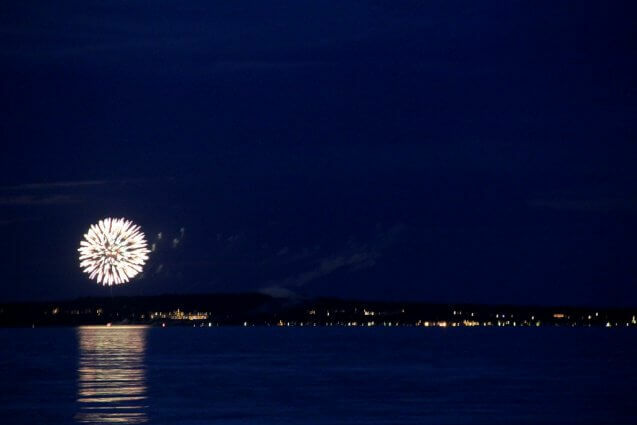 Early in the day, people start setting their chairs and claiming spots to view the spectacular fireworks display from Mackinaw City, St. Ignace and Mackinac Island. Of course, a beautiful sunset only adds to spectacle. Fireworks over the Grand Hotel on Mackinac Island as viewed from the shore of Mackinaw Mill Creek Camping. In July, it takes till nearly 10pm for the extremely long twilight in Mackinaw's skies to darken enough for the fireworks to begin. 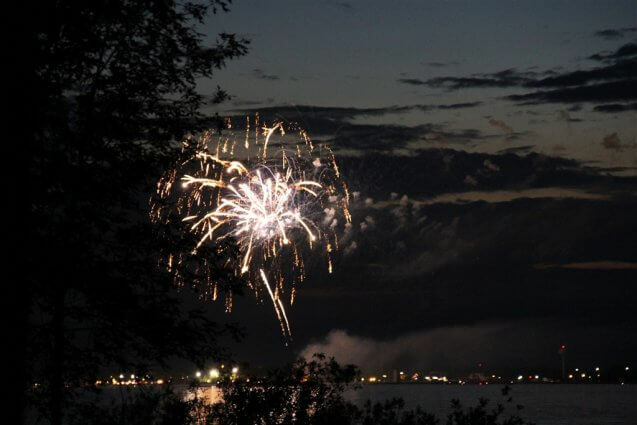 From the shore of Mackinaw Mill Creek Camping, campers view fireworks over Mackinaw City. 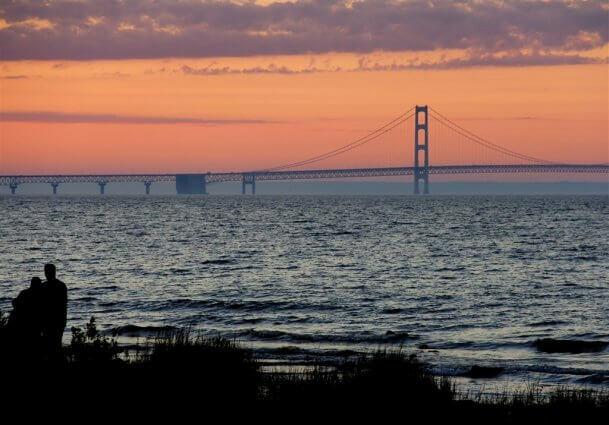 An exquisite sunset illuminates the Mackinac Bridge as seen from the shores of Mackinaw Mill Creek Camping. Camping on the Fourth of July most anywhere is a communal experience. So if you don't enjoy being around a lot of people you might want to come to Mackinaw Mill Creek Camping most any other time of the year (other than the 4th or Labor Day). 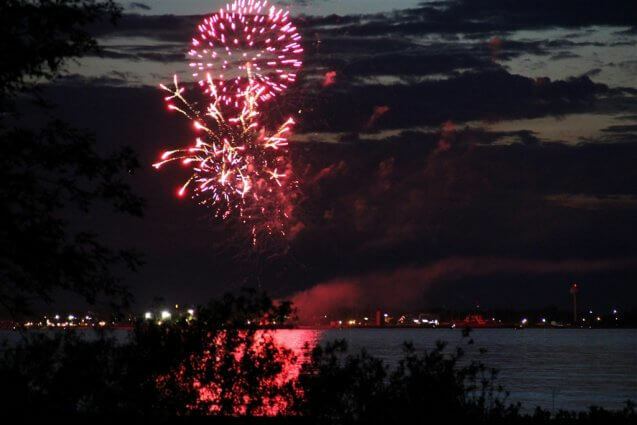 The rewards for those who do camp on the Fourth of July are: lots of people watching, meeting up with new and old friends, spectacular fireworks display and beautiful northern Michigan July weather. 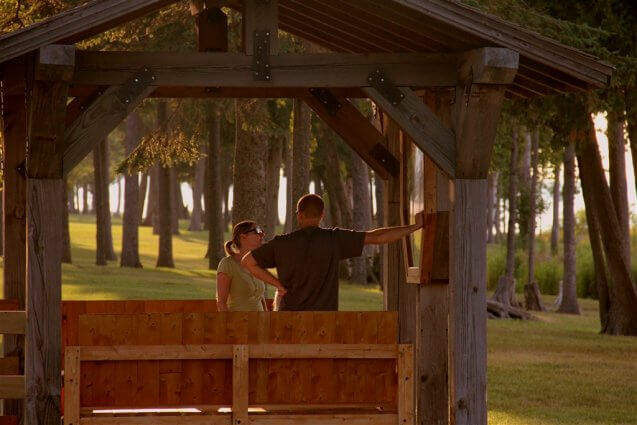 Along with miles of trails great for hiking and biking, Mackinaw Mill Creek Camping also has many picturesque places to relax, rest and enjoy your beautiful surroundings. 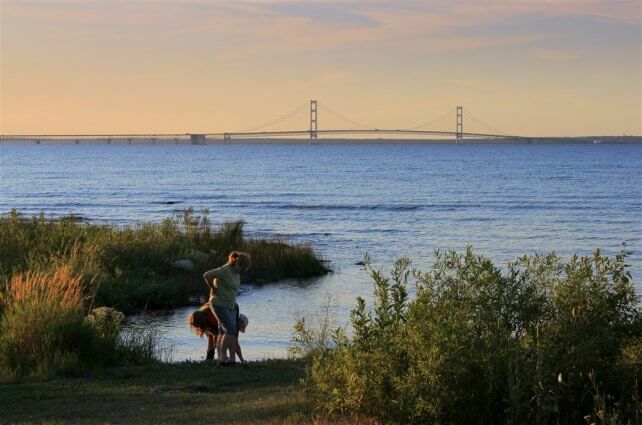 Mackinaw Mill Creek Camping's one mile of shoreline is shared by all campers. Pictured in the distance are some folks taking a stroll on the boat launch, that, due to recent low lake levels, hasn't seen much action from boats launching. 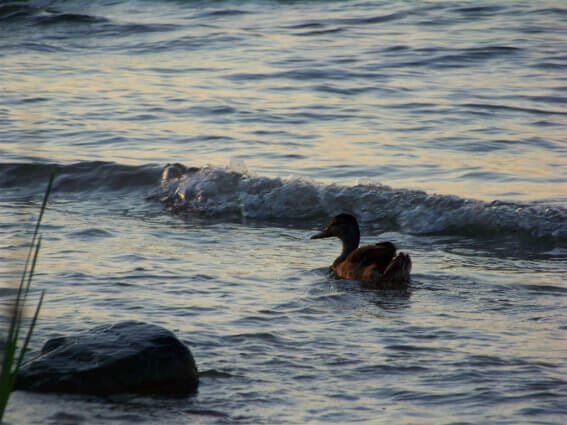 However, campers seem to enjoy it as a place to stand out amidst Lake Huron, the incoming waves and the cry of the gulls. 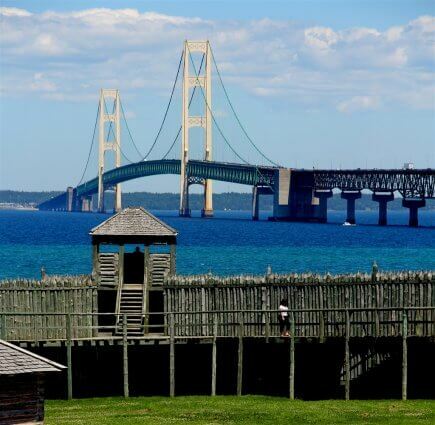 Now onward to Mackinaw City and revolutionary war period Fort Michilimackinac (Colonial Michilimackinac). No photo trickery involved, this is actually the spectacular view from the upper level of the stockade of the Fort. 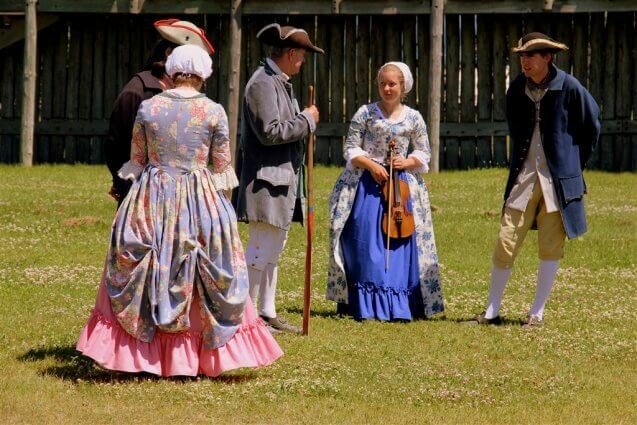 Colonial clad historical guides give demonstrations and tours that will acquaint you with life in the bygone era of the Revolutionary War period Fort Michilimackinac (Colonial Michilimackinac). Dressing in traditional clothing, Native American descendants of tribes that occupied the Straits of Mackinac are available to greet visitors and give demonstrations and answer questions. 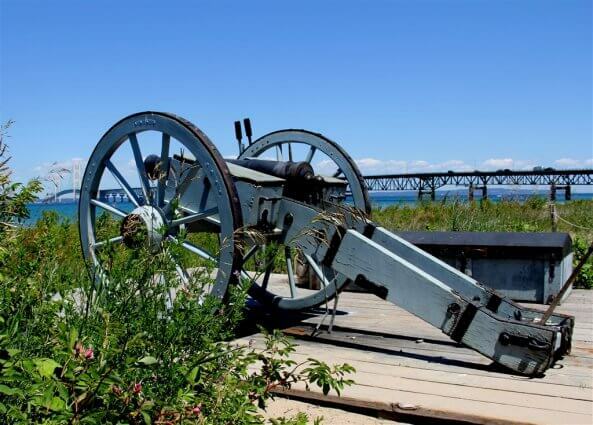 A revolutionary war period cannon at Mackinaw City's Fort Michilimackinac (Colonial Michilimackinac), which is fired on-the-hour, every hour, while the Fort is open to visitors. Imagine behind you sits a wooden fort as if ripped from the pages of history and in front of you sits one of the wonders of the modern world - the Mackinac Bridge. 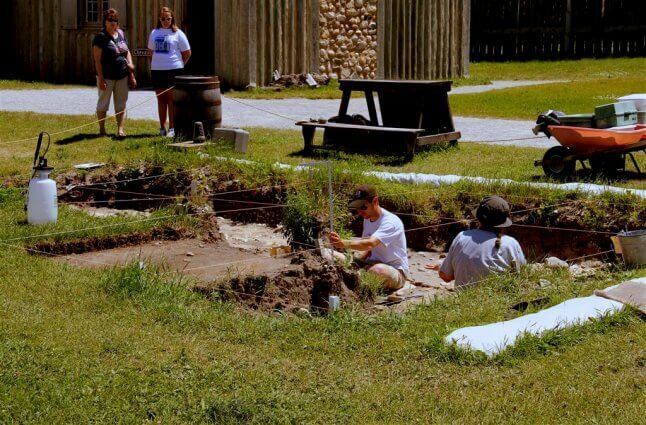 Archaeologists excavate inside the stockade of Fort Michilimackinac (Colonial Michilimackinac) as visitors look on. Each summer archaeologists excavate a portion of the grounds of the Fort. Results of their work, such as ornate buttons, fragments of pottery, coins and other evidence of life in the late 1700s can be seen in displays throughout the Fort's exhibits. 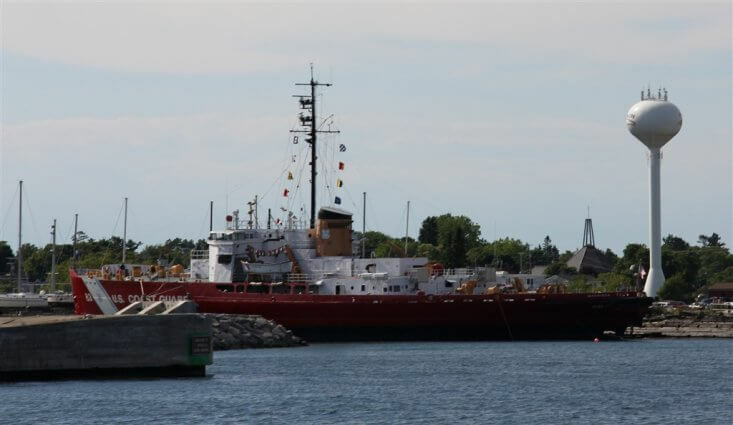 Also in Mackinaw City is the Coast Guard's Icebreaker Mackinaw, which is open to the public. This amazing vessel has the equivalent of six locomotive engines. 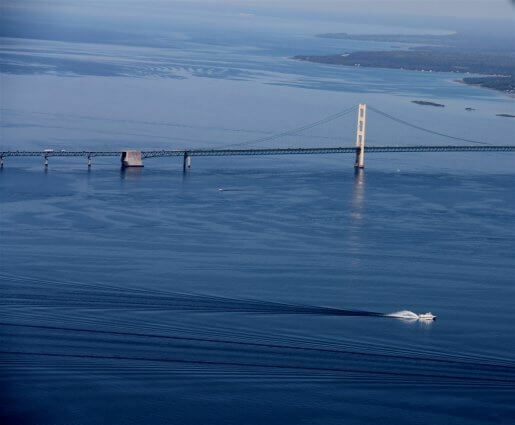 Guided tours will take you on a fascinating glimpse into not only the treacherous science of icebreaking, but also the history of our country and the important role that the Icebreaker Mackinaw played after the attack on Pearl Harbor, during World War II. 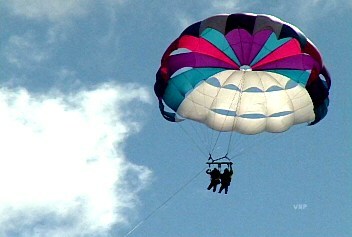 Visitors to Mackinaw can parasail high above the Straits and achieve a thrilling view of the Mackinac Bridge and Mackinac Island without ever getting wet. 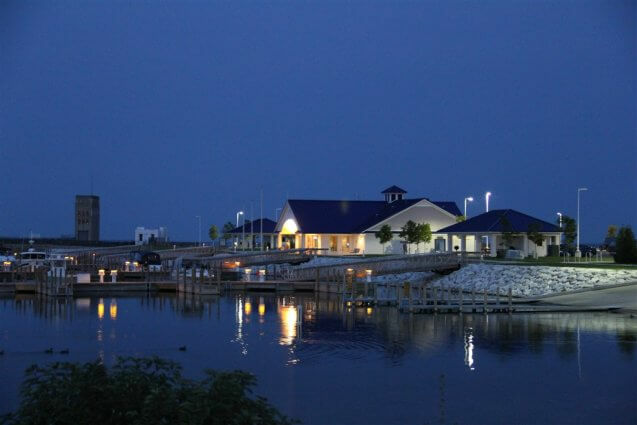 Mackinaw City features two full-featured marinas, which are open to the public. This is the newer of the two, the Michigan State Marina, which has the distinction of being partially powered by wind turbines. 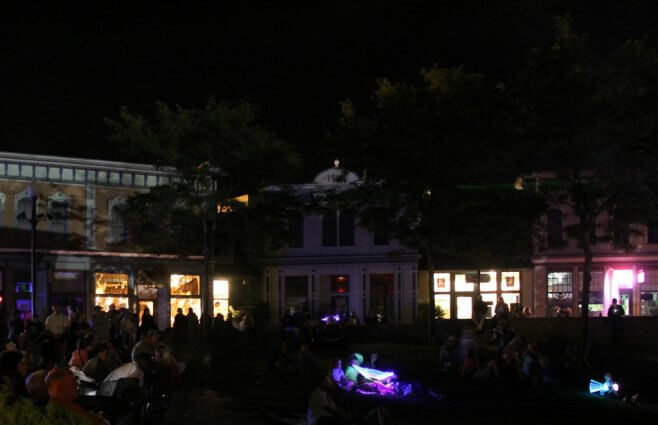 Many visitors to Mackinaw City enjoy the free laser light/music show that is held nightly at the Mackinaw Crossings shopping area. 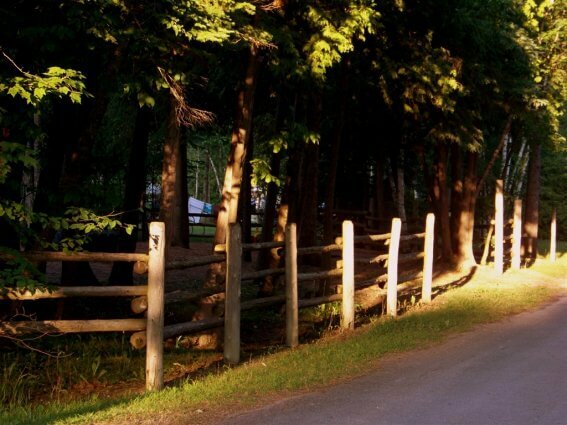 Back at the campground, sun highlights the wooden fence alongside the playground in the campgrounds supersaver area. This is one of three playgrounds at Mackinaw Mill Creek Camping. 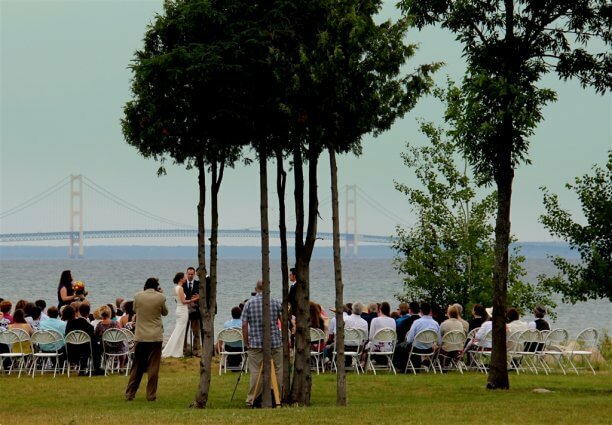 Mackinaw Mill Creek Camping also plays host to several weddings each season. 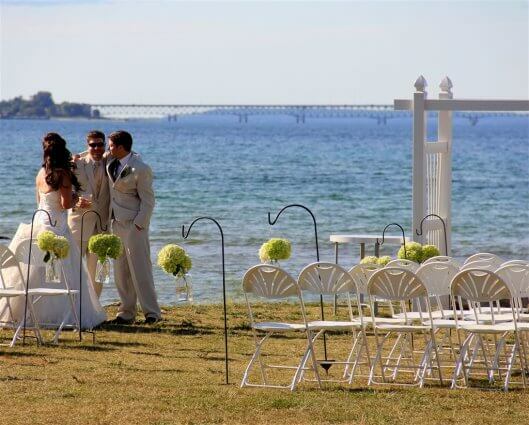 Imagine your wedding on the Straits of Mackinac with the Mackinac Bridge in the background. 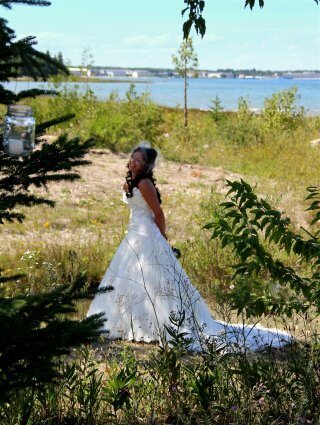 Here is a Mackinaw Mill Creek Camping wedding in progress on the shores of Lake Huron. Mackinaw Mill Creek Camping wedding guests begin celebrating the event a few steps away from where the ceremony took place in a large event tent. 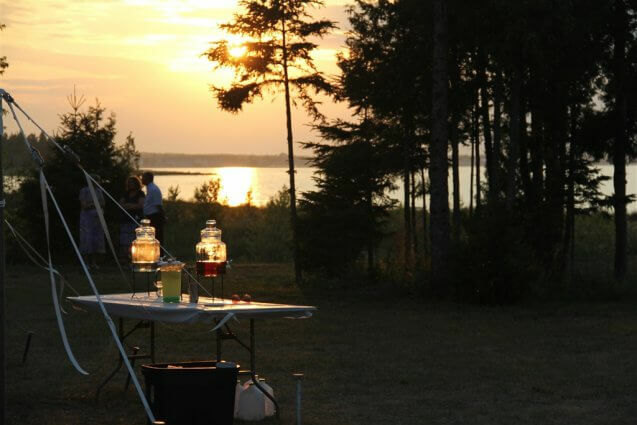 The sun sets on another Mackinaw Mill Creek Camping wedding as the guests dance and celebrate. 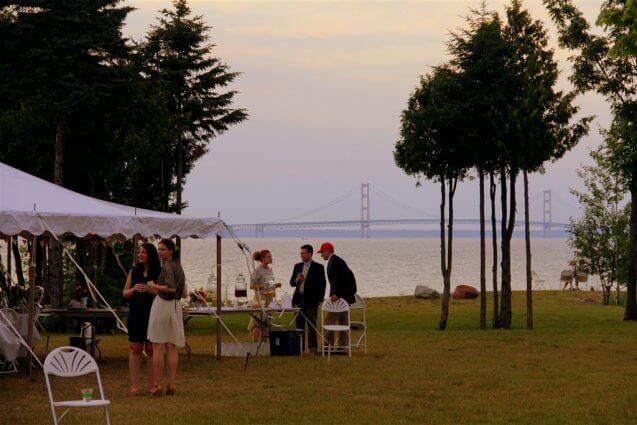 A Mackinac sunset reflects in the wedding guest's refreshments as guests enjoy the evening. 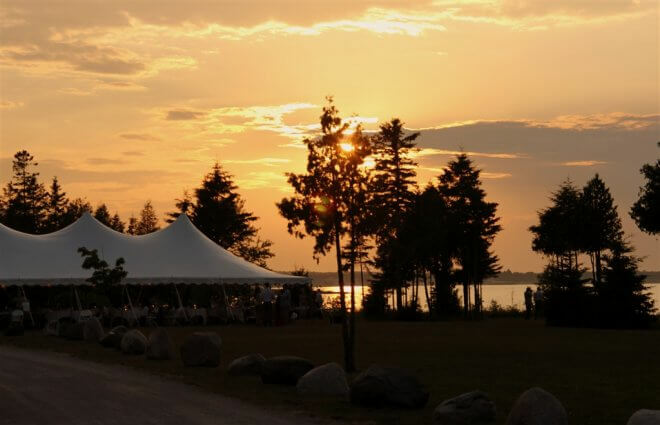 This Mackinaw Mill Creek Camping wedding couple celebrates a moment with their best man on the shores of Lake Huron, with the Mackinac Bridge as a backdrop. 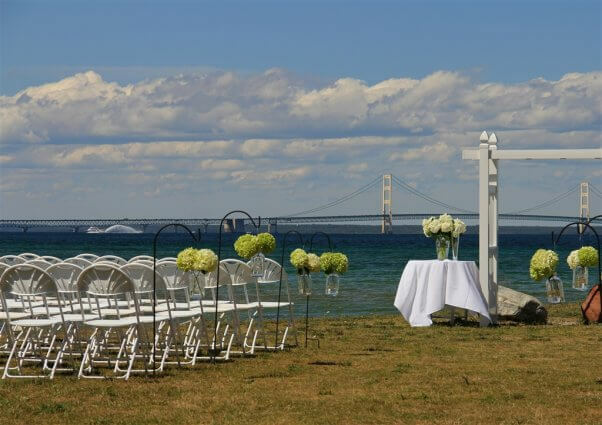 Here is a sample of the spectacular view that the guests of the Mackinaw Mill Creek Camping wedding enjoyed during their ceremony. 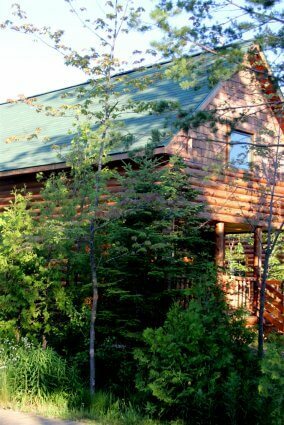 Mackinaw Mill Creek Camping's cabin choices include beautiful "loft" cabins with three bedrooms, which can accommodate six people, two per bedroom. 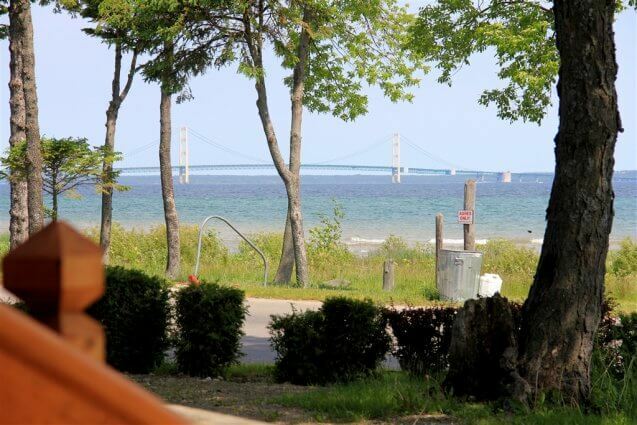 Here is a view from the porch of one of Mackinaw Mill Creek Camping's Bridgeview cabins. 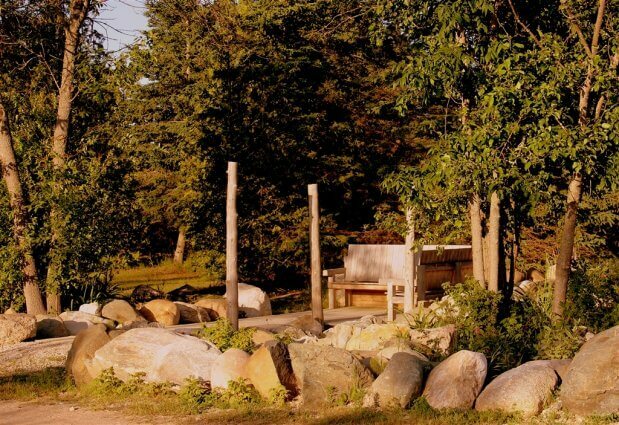 Mackinaw Mill Creek Camping's cabins feature combination fire ring / grills which are a favorite gathering place. 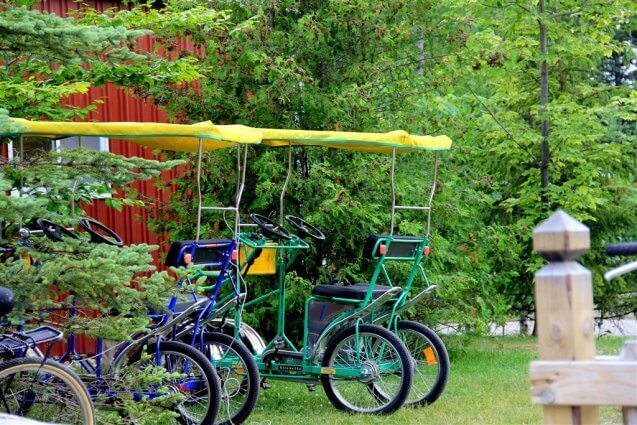 Mackinaw Mill Creek Camping's Park Store (open Memorial Day through Labor Day) features surrey carriage bike rentals. For other types of bike rentals you can rent online see our Bike Rentals page. The Park Store has been Renovated! Mackinaw Mill Creek Camping's Park Store (open Memorial Day through Labor Day) has undergone extensive renovations and additions. Its size has increased by over one-third. 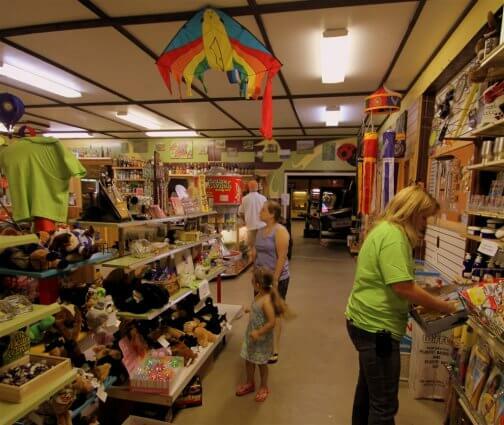 Here is an inside view of Mackinaw Mill Creek Camping's Park Store (open Memorial Day through Labor Day). Here you can see some of the children's items including stuff animals, candy and toys. On the back wall you can see the selection of liquor as well as the entrance to the arcade. 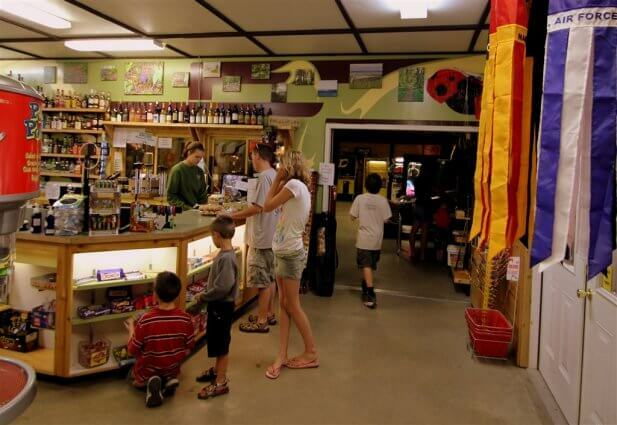 This is a view of the checkout area of the campground's Park Store (open Memorial Day through Labor Day). You can see the wall above the cashier that features photographs of the park. 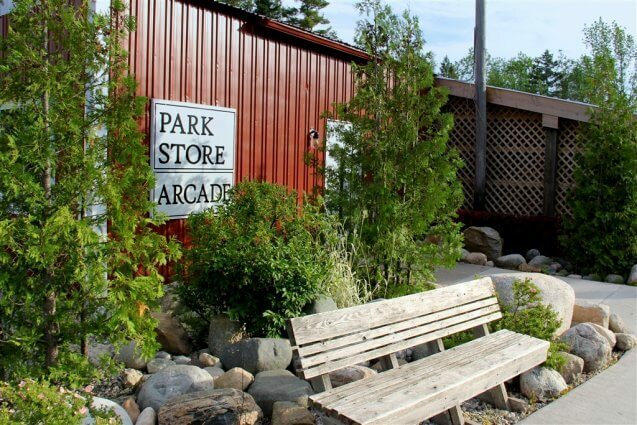 This is Mackinaw Mill Creek Camping's arcade (open Memorial Day through Labor Day) which features two pool tables, arcade and pinball games, as well as a free (to our guests) Internet computer. A bench awaits guests bearing ice cream cones who want to sit a spell and enjoy the view and the camp's hospitality. (Open Memorial Day through Labor Day). 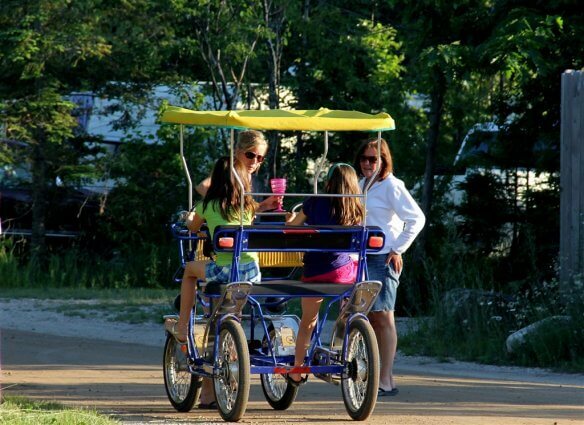 Carriage bicycles for two (surrey carriages) can be rented by the half-hour at Mackinaw Mill Creek Camping's Park Store (open Memorial Day through Labor Day). 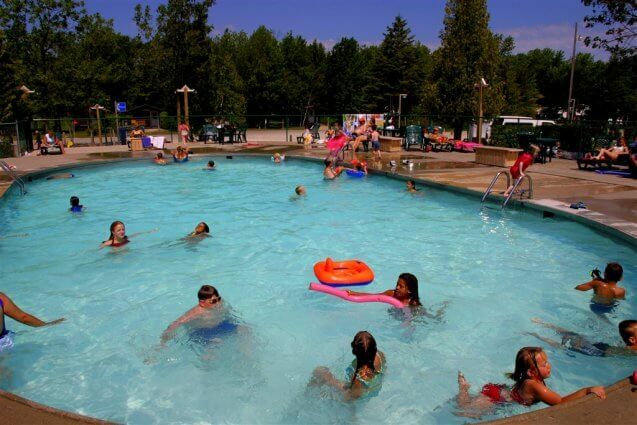 A heated pool is among the many facilities available to the guests of Mackinaw Mill Creek Camping (open Memorial Day through Labor Day). 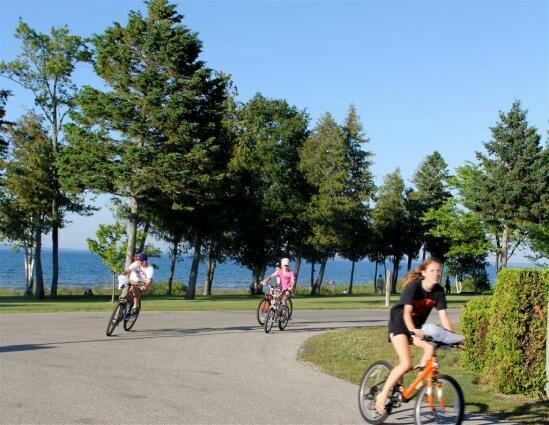 Don't forget your bicycle, not just for riding through the park, but also for taking the trail to Mill Creek Discovery Park or the trail to Mackinaw City. Bike Rentals can be rented from the park store (open Memorial Day through Labor Day). 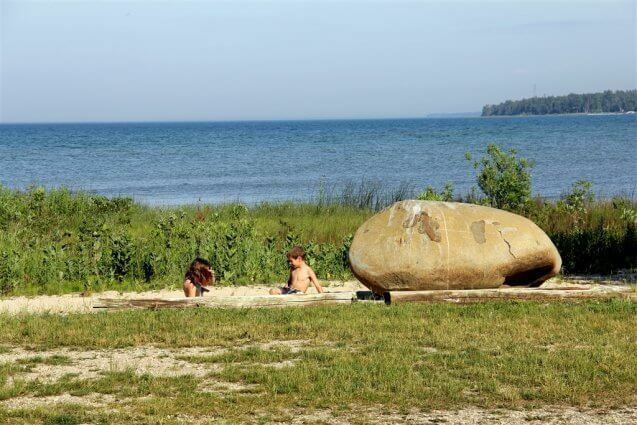 Children playing in the sand on what is historically known as Cadottes Point near a glacially deposited rock on the shore of Mackinaw Mill Creek Camping. Campers enjoying, photographing and kayaking on the shores of Mackinaw Mill Creek Camping as the sun sets over Mackinaw City. Mackinaw Mill Creek Camping campers enjoy the extended hours of twilight which make for long periods of gorgeous evening colors in the summer Mackinaw sky. 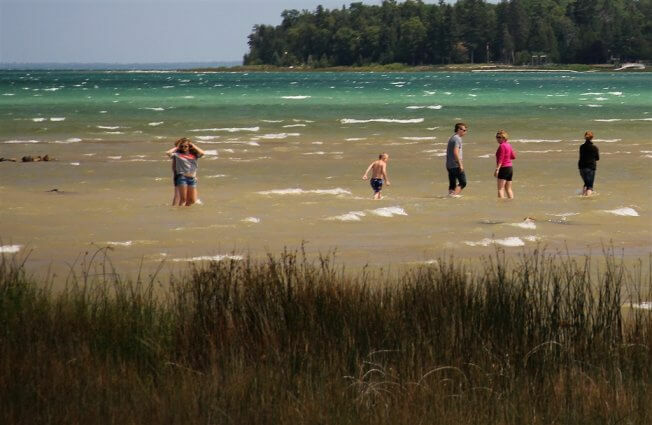 Mackinaw Mill Creek Camping's shoreline features a bay as well as a natural beach that is shallow and safe for children. 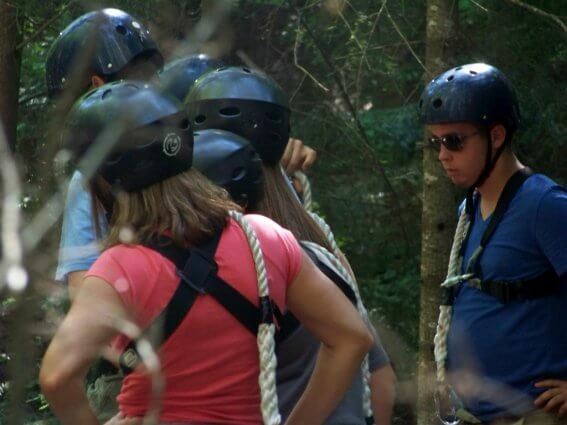 Now on to Historic Mill Creek Discovery Park, just a hop and a skip south of Mackinaw Mill Creek Camping, where these adventurers are about to embark on the tree-line canopy bridge that takes them up into the air on the same level as the treetops. 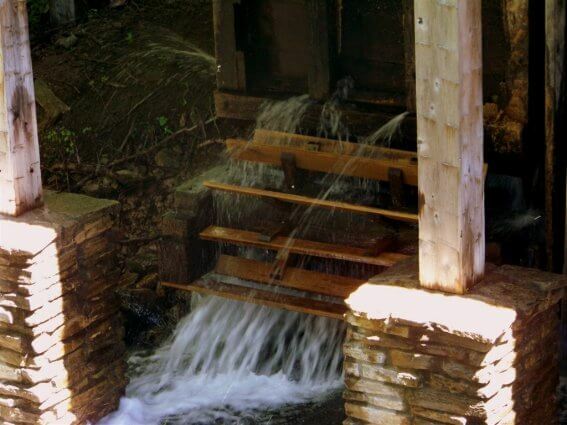 A close-up view of the turbine that powers the Revolutionary War period "water powered" sawmill at Historic Mill Creek Discovery Park. 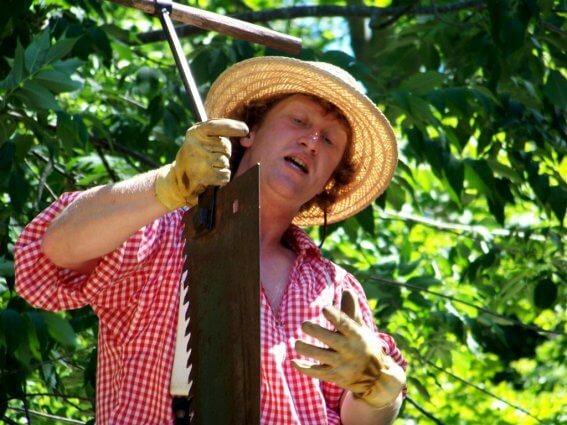 Here, a Historic Mill Creek Discovery Park guide in period garb explains the technology of the Revolutionary War period sawmill and its equipment. 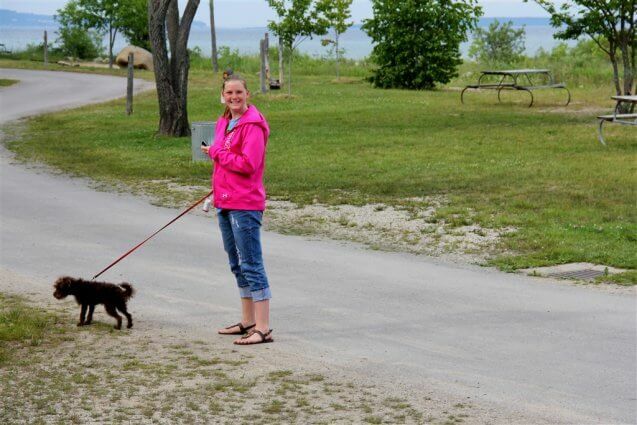 A couple of our guests illustrate that Mackinaw Mill Creek Camping is a pet friendly campground. 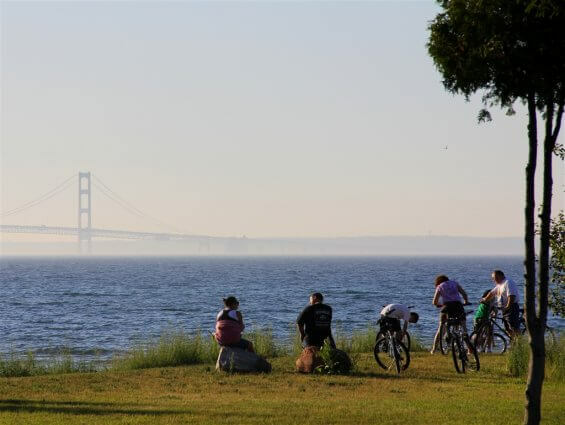 As this Mackinaw Mill Creek Camping guest is experiencing from our shore, Mackinac Island looks close enough to reach out and touch on days with low humidity. 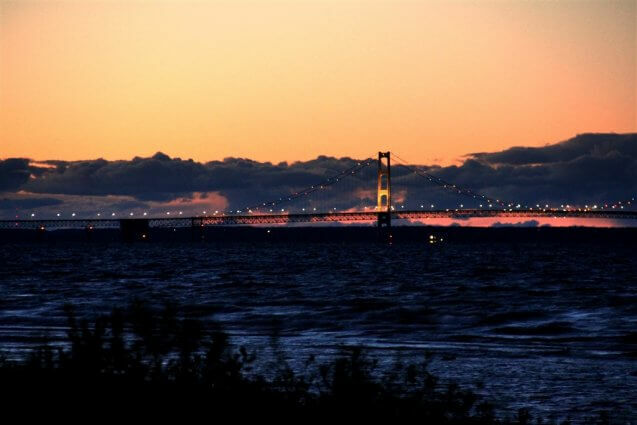 From the shores of Mackinaw Mill Creek Camping, the sun and clouds create another panoramic spectacle as the sun sets behind the Mackinac Bridge. 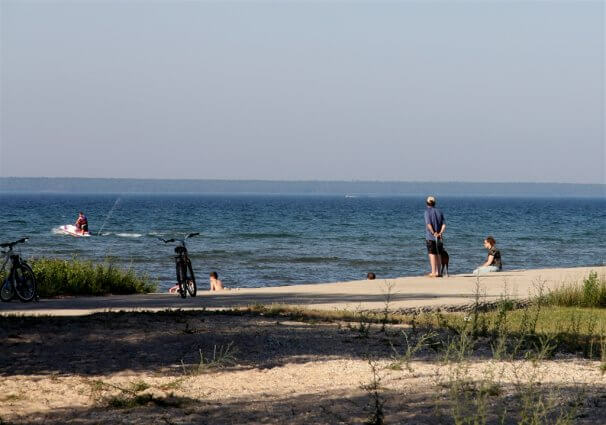 Mackinaw Mill Creek Camping's one mile of shoreline and natural beaches gives everyone a chance to experience their own little piece of the Straits of Mackinac. 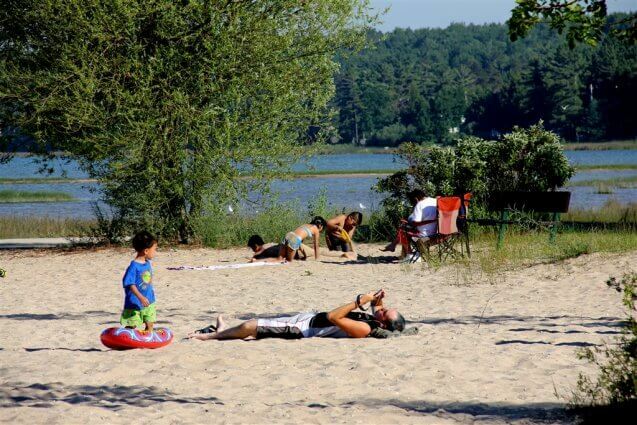 A warm July day and Mackinaw Mill Creek Camping's guests enjoy the sandy beach. 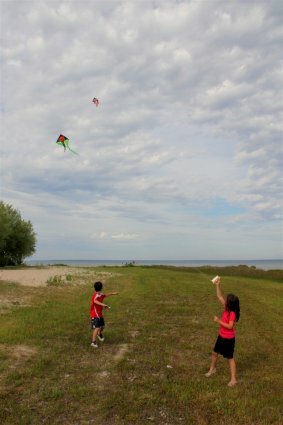 A windy day is no problem when Mackinaw Mill Creek Camping's Park Store (open Memorial Day through Labor Day) has a huge selection of kites to choose from. 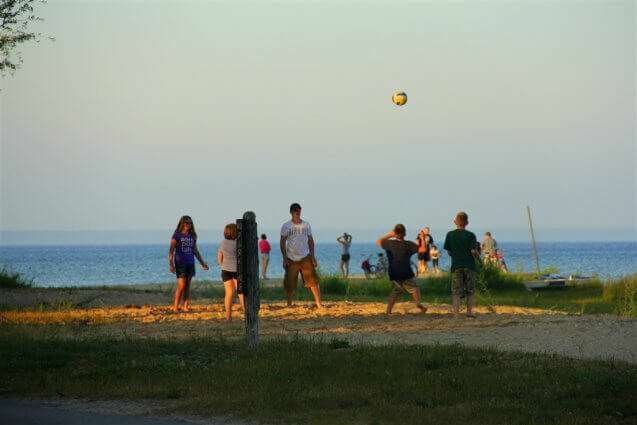 Campground guests enjoy a game of "net less" volleyball as the golden light of another Mackinaw sunset shines down. 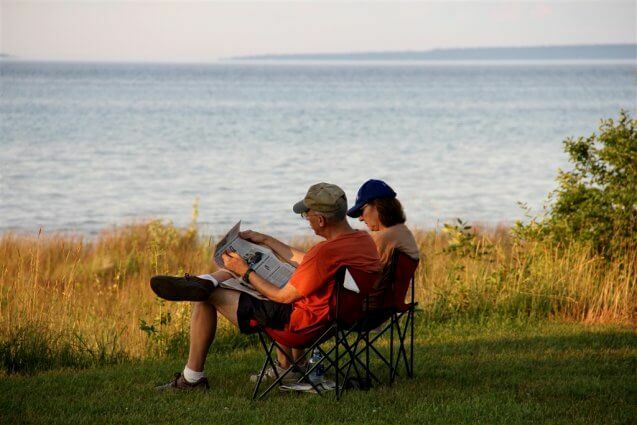 If it's not Fourth of July weekend or Labor Day, it's not hard to find solitude in a quiet moment along the one mile of shoreline at Mackinaw Mill Creek Camping. Nearly all of Mackinaw Mill Creek Camping's campsites allow guests to build their fire anywhere on their site that they choose. Campers can bring their own fire container or use one for free (available at the office and the Park Store, open Memorial Day through Labor Day). Fire containers are emptied and picked up daily, avoiding yummy campfire waste smells that might attract varmints (like raccoons, skunks, bear, etc.) seeking a meal. This is a regular sized camp site, which as you can see, easily fits not only a full size tent trailer but also two vehicles and still leaves room for bikes, a picnic table and a campfire. 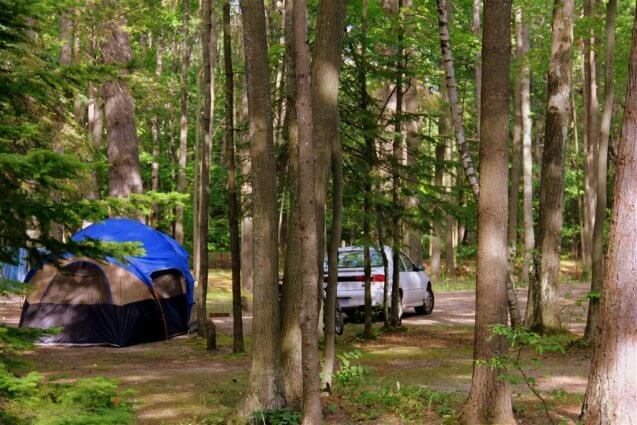 Mackinaw Mill Creek Camping's Supersaver Campsites are situated amongst some beautiful old-growth trees. Sites are available here at a bargain price, but are a bit smaller than what are now the larger "regular" campground sites. Even larger "big rig" or "extra large" sites are available for those willing to pay a few dollars more. One thing that the camp offers is lots of choices! 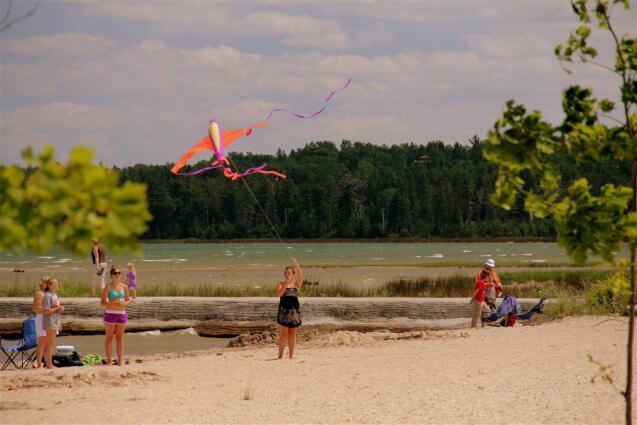 Mackinaw Mill Creek Camping's guests enjoy a warm August day on the sandy beach. 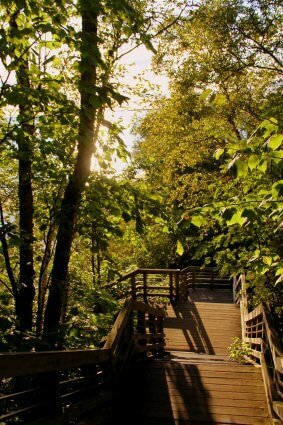 Just across the Mackinac Bridge the Upper Peninsula features many amazing attractions and beautiful vistas such is this stairway at the Cut River Bridge along US Highway 2. Structural remnants from a bygone era, near the base of the Cut River Bridge in Michigan's upper Peninsula, just a short drive from Mackinaw Mill Creek Camping. Cut River meets Lake Michigan here at the base of the Cut River Bridge. 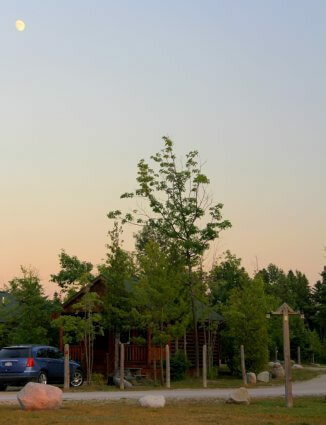 A small roadside park makes this location available to visitors. A fall sunset in the Upper Peninsula along Highway US 2 colors the landscape in gorgeous hues. A spectacular sunset falls over Epoufette Bay in Michigan's Upper Peninsula. 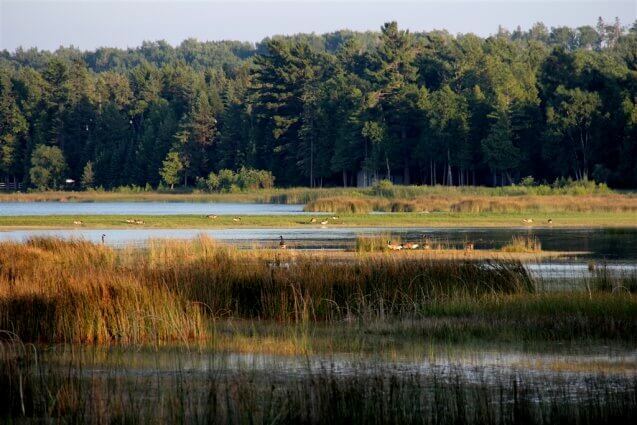 This is another spectacular view along Highway US 2, only a short distance from Mackinaw Mill Creek Camping. 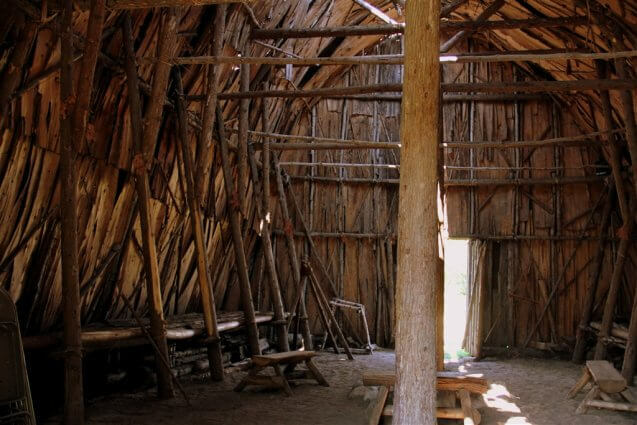 This reconstruction of a Native American Ottawa meeting place is located near the Father Marquette Museum and burial site in St. Ignace, just across the bridge from Mackinaw Mill Creek Camping. The site also has an informative museum outlining the history of the area's Native American tribes. 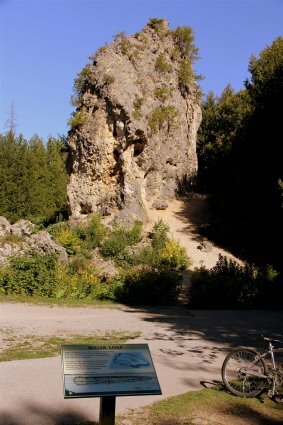 Just across the Mackinac Bridge, near St. Ignace, only a few miles from Mackinaw Mill Creek Camping, is a geological curiosity known as Castle Rock. Back at the campground, an impromptu volleyball match breaks out between guests of Mackinaw Mill Creek Camping with the Mackinac Bridge looming on the horizon. 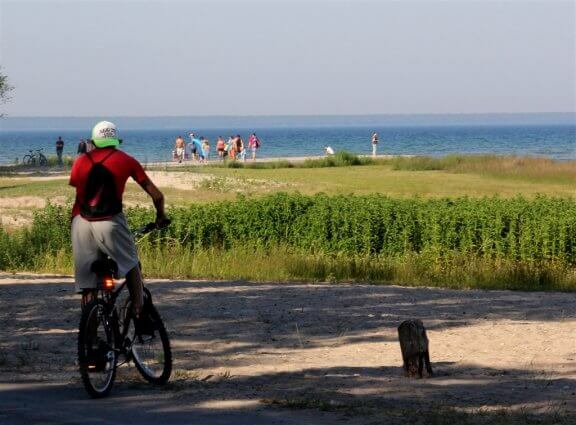 Campers enjoy late August afternoon bike ride near Mackinaw Mill Creek Camping's shoreline. 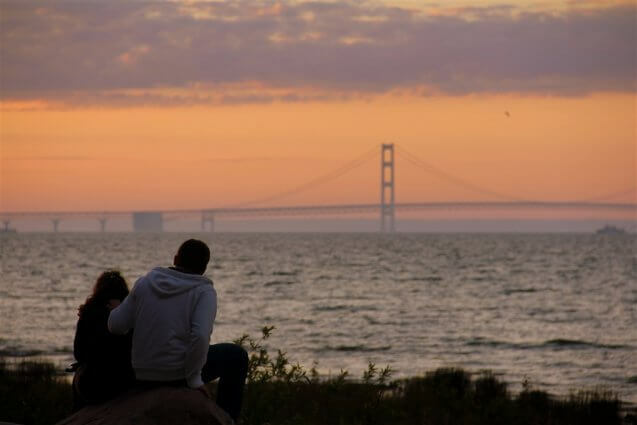 A popular activity at Mackinaw Mill Creek Camping is watching the extended sunrises that are a result of the camp's location high in the northern hemisphere, which provides for many hours of evening twilight during June and July. 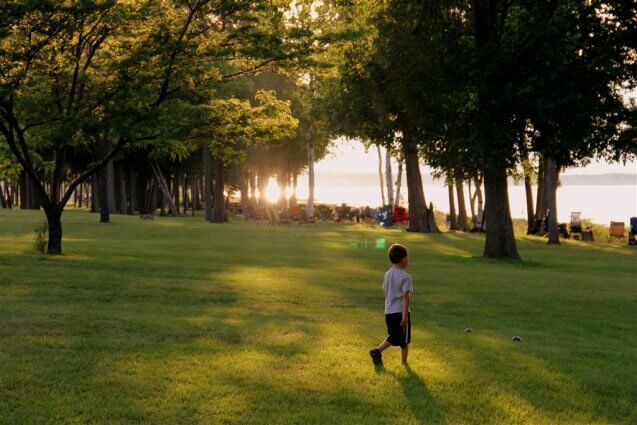 Mackinaw Mill Creek Camping was chosen as one of Michigan's top family friendly locations by The Detroit News. Add "pet friendly" to that and you've got it covered! 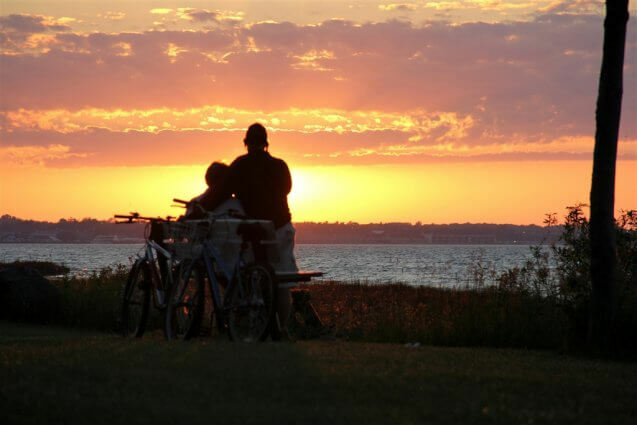 Parents breathe a sigh of relief as their children burn off all that World-Famous Mackinac Fudge, riding bikes as the sun sets on the shore of Mackinaw Mill Creek Camping. 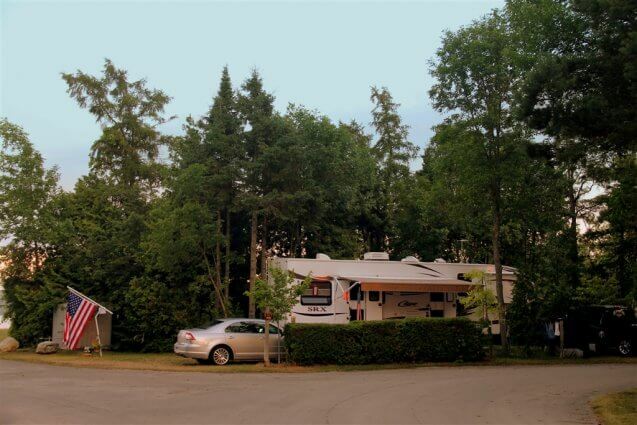 Large RVs have no fear; Mackinaw Mill Creek Camping has sites that can accommodate even the largest units. This is a regular water and electric site; however there are even larger Full Hookup (sewer, water & electric) sites available for the really big RVs. 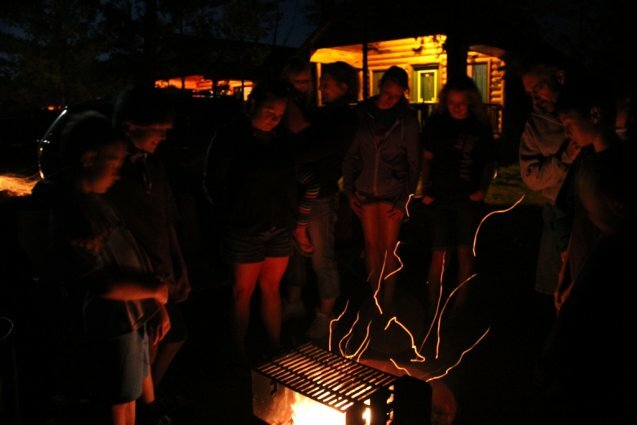 Guests enjoying their time together around a campfire at Mackinaw Mill Creek Camping. 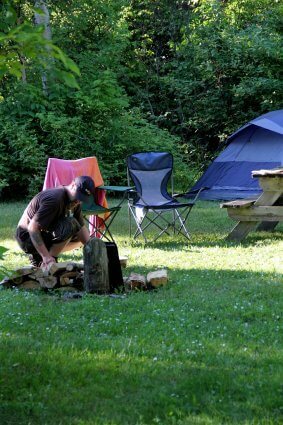 Mackinaw Mill Creek Camping is the only campground that we know of that allows their guests to place their campfire wherever they choose on their site. This also provides for a cleaner camp site, as campfire waste can be disposed of easily and daily, preventing the campground, even though it's located in the midst of miles of wilderness, from being overrun by raccoons, skunks, etc. 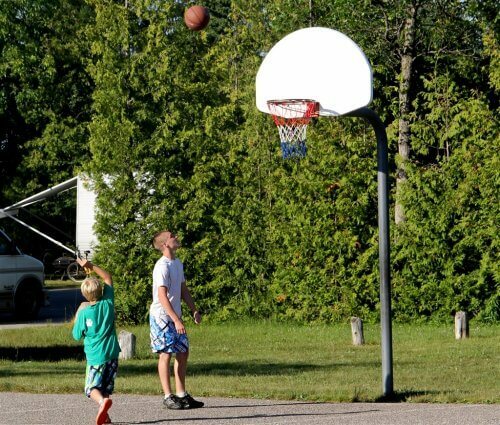 Mackinaw Mill Creek Camping features a full-size basketball court, near the service buildings in the Lake area, as well as a secondary small basketball court for campers in the Supersaver area. What good is a vacation if the kids aren't exhausted at the end of the day? A vacation is all about recharging your battery, and what better way to do that than to have your children occupied and active while you have a moment to yourself. 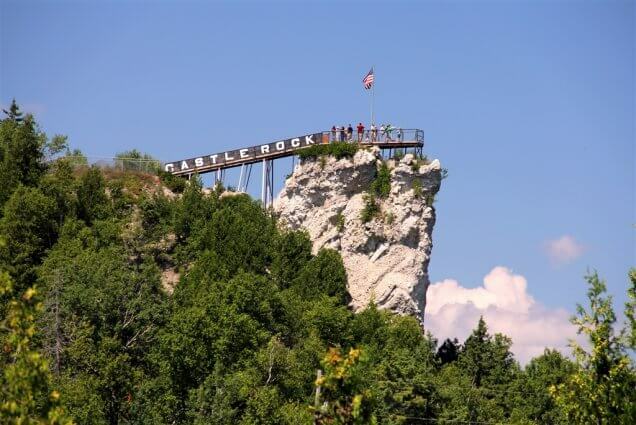 In the foreground is Mackinaw Mill Creek Camping's "Big Rock." Deposited by glaciers over 30,000 years ago, this big rock has become well known as a marker of the entrance to the campground's full hookup area. A schooner crosses under the Mackinac Bridge during a picturesque sunset while the children of campers from Mackinaw Mill Creek Camping play on the shores of Lake Huron. 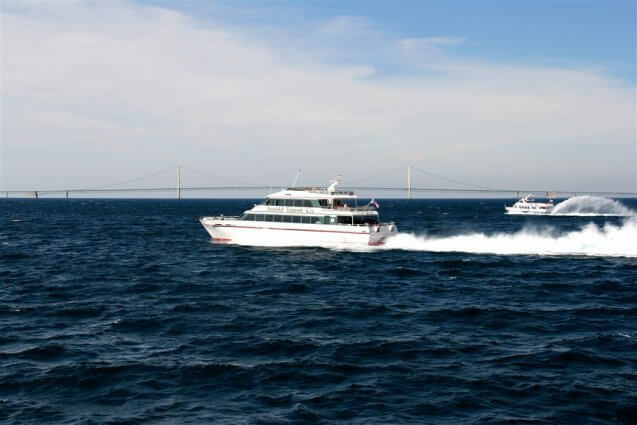 What better way to enjoy the view of the Straits of Mackinac, Mackinac Island ferries, Mackinac Island, Round Island, Bois Blanc Island, Mackinaw City, and St. Ignace than with a zero gravity chair. 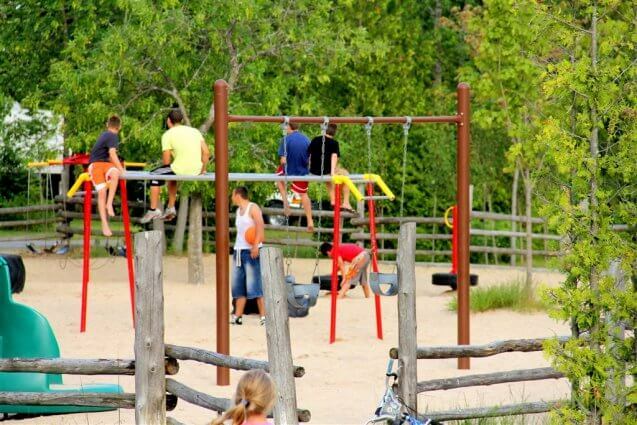 Campers at Mackinaw Mill Creek Camping have their choice of three separate playgrounds. Mackinaw Mill Creek Camping guests enjoy a warm July afternoon on the camp's natural sandy beach. 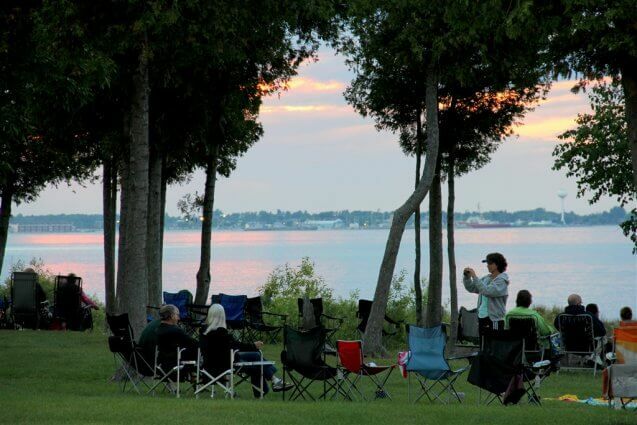 Campers line the shore of Mackinaw Mill Creek Camping in preparation for the Fourth of July fireworks display from Mackinaw City, St. Ignace, and Mackinac Island. Boaters will find no shortage of great opportunities in the Mackinaw area. 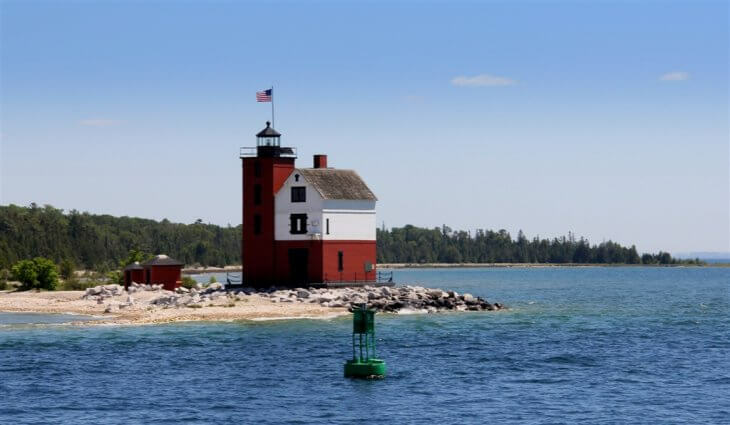 Just a short trip south of the campground is the mouth of the Cheboygan River, the gateway to the famous Inland Waterway. 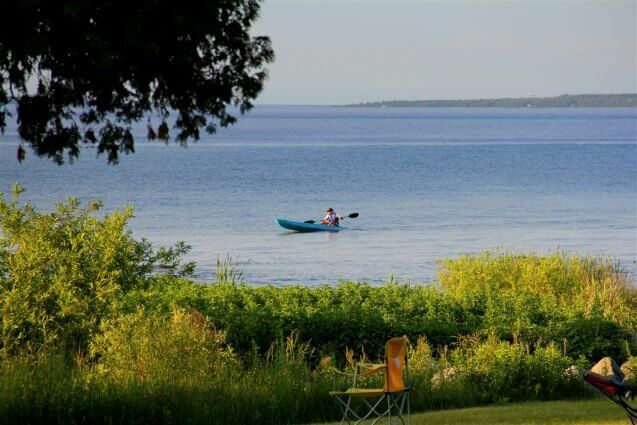 Kayaking has very quickly become a favorite pastime for Mackinaw Mill Creek Camping guests. Outpacing canoes, motor boats, and jet skis, kayaks are very common sight along the campground's shores. 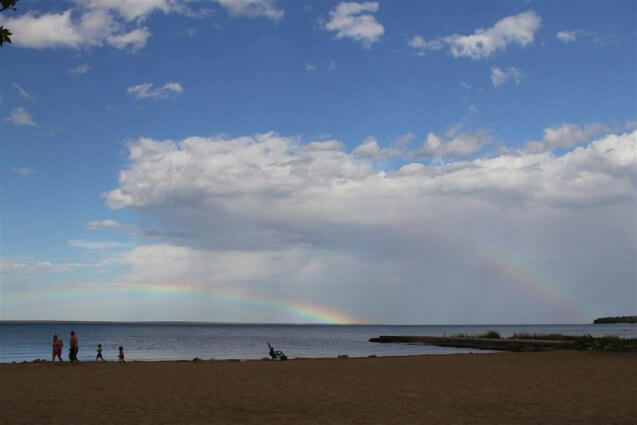 Double and triple rainbows are a common sight from the shore of Mackinaw Mill Creek Camping during the summer months. The campground's location is ideal for watching weather fronts come together, which makes for lots of mixing of rain and sunshine which = rainbows! 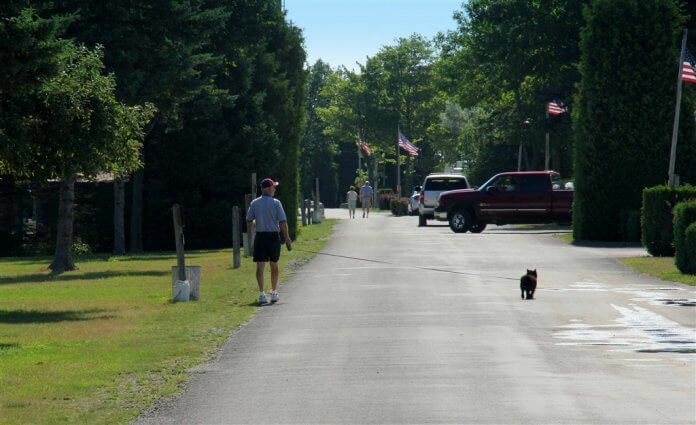 A camper walks his dog, strolling along the front of the campgrounds main, and oldest, full hookup section. This section, known to our campers as roads 1 through 9, is notorious for its 25' x 50' full hookup campsites, which can be a bit tight for larger modern RVs. We have started expanding (doubling the size) of these sites, which you can see by looking at the already finished (expanded) sites on road 6. Over the next few years we will be expanding the rest of the sites as fast as we are able. In the meantime, the campground has dozens of extra-large RV full hookup sites already available for the big boys. 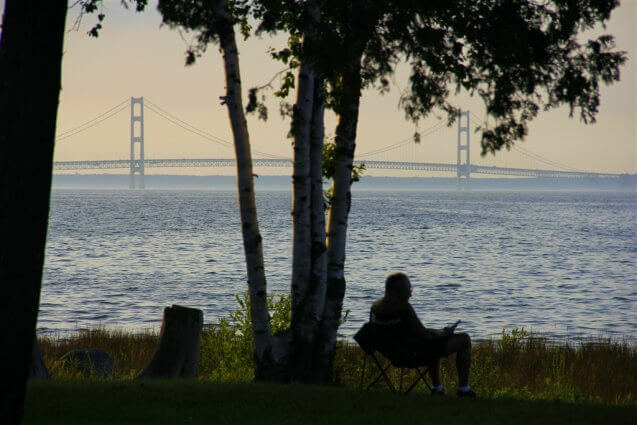 Mackinaw Mill Creek Camping offers a variety of cabin options for campers, many on or near the lake with views of the bridge. This cabin sits under a moon during the extended twilight hours. 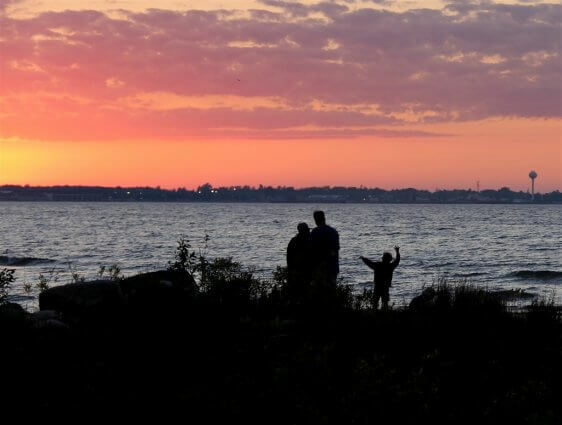 Campers enjoying a late September sunset over Mackinaw City, on the shores of Mackinaw Mill Creek Camping. 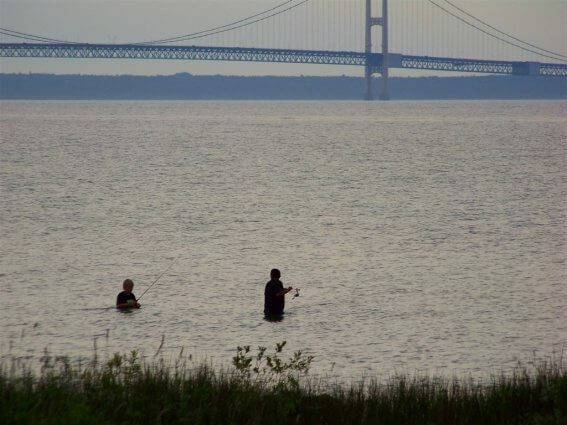 Campers fishing on the shores of Mackinaw Mill Creek Camping with the Mackinac Bridge in the background. 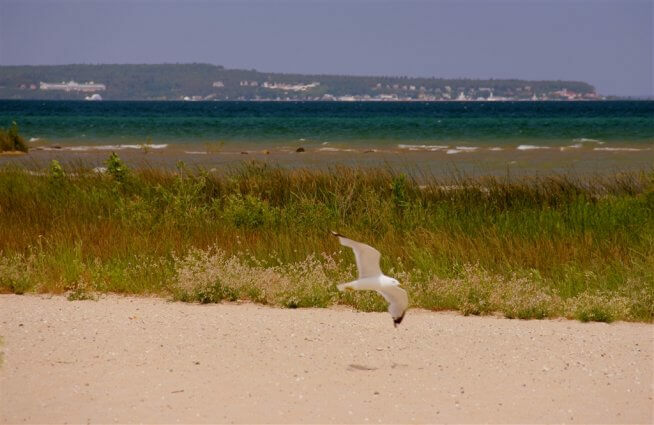 A gull glides by Mackinaw Mill Creek Camping's natural beaches as Mackinac Island looms in the background. 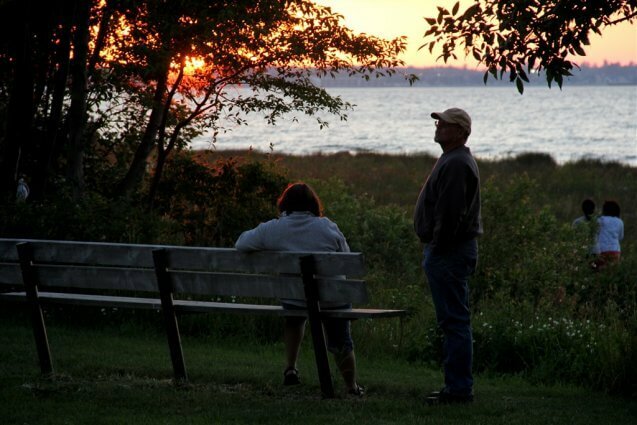 A couple enjoys the extended twilight after a Mackinac sunset from the shores of Mackinaw Mill Creek Camping. 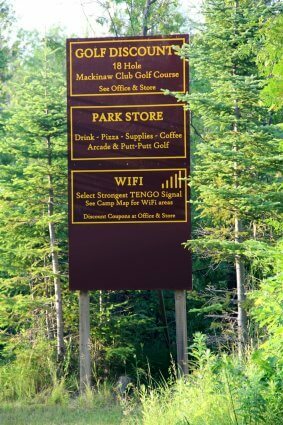 Message Boards at Mackinaw Mill Creek Camping are located throughout the park and near service buildings to give information on the area and provide maps to help campers locate their surroundings. 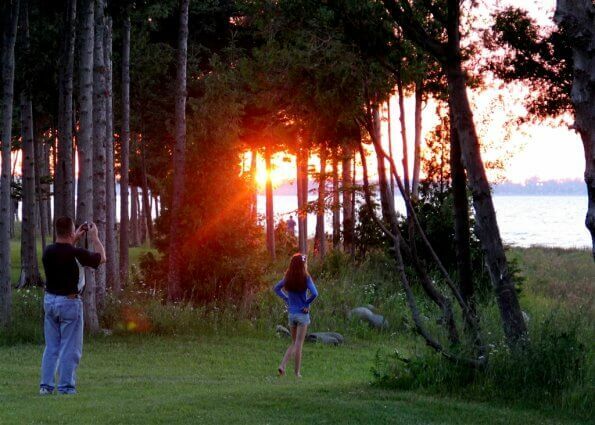 Campers at Mackinaw Mill Creek Camping enjoy an evening stroll near the ubiquitous "Big Rock." 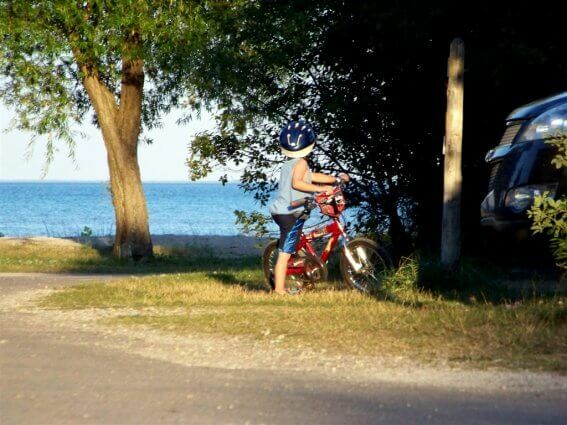 This little guy's bicycle is almost bigger than he is, but he is lucky that his parents chose a campsite right across from the sandy beach. 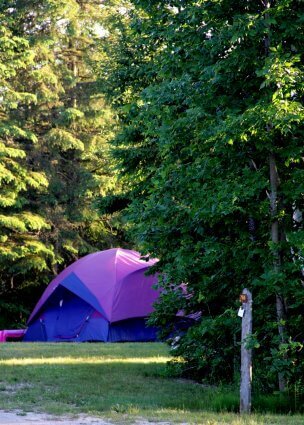 This is a view of a tent camper site in Mackinaw Mill Creek Camping's Supersaver area. 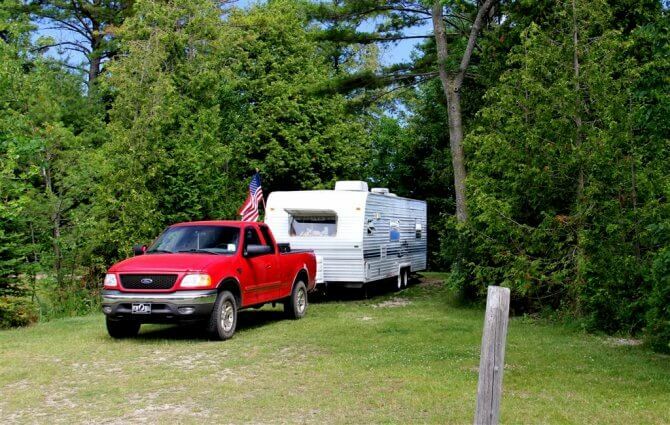 Mackinaw Mill Creek Camping is not just for large RVs. Campers of all sizes, including tent campers, find just what they need in the campground's 200 acres, featuring nearly a dozen site types. 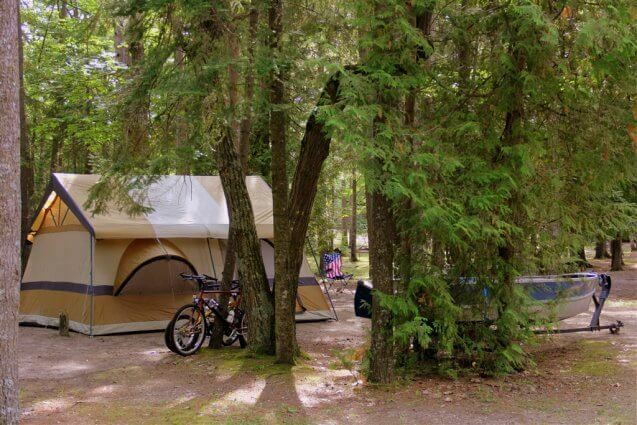 Small tent trailers and tent campers will find comfortable lakefront accommodations at Mackinaw Mill Creek Camping. These campers brought their own bicycle built for two, while the campers in front of them rented their bicycle carriage (surrey carriage) at the Park Store (open Memorial Day through Labor Day). Bike Rentals from the Park Store can now be reserved online! 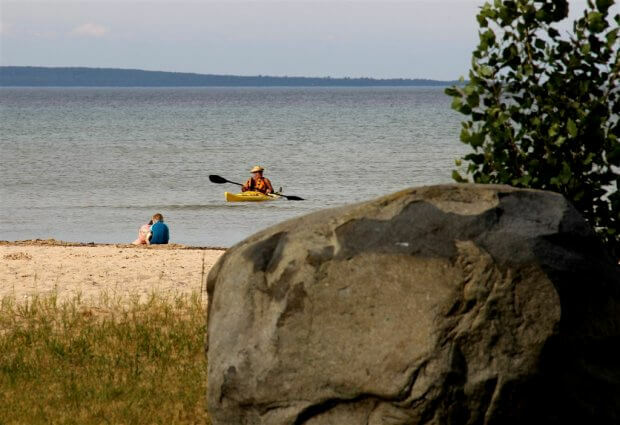 Mackinaw Mill Creek Camping features one mile of natural beaches, however, the sandy portion of our beach is located in a bay that typically has water temperatures 8 to 12 degrees warmer than the water in the big lake. 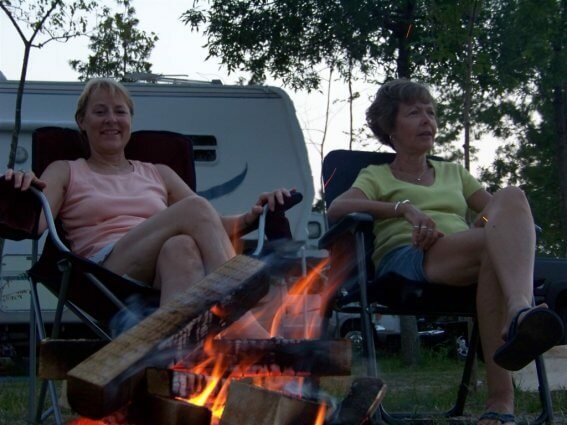 Mackinaw Mill Creek Camping is known for its friendly staff. Most of our staff are made up of our "workampers," many of whom live in their RVs and travel "full-time." 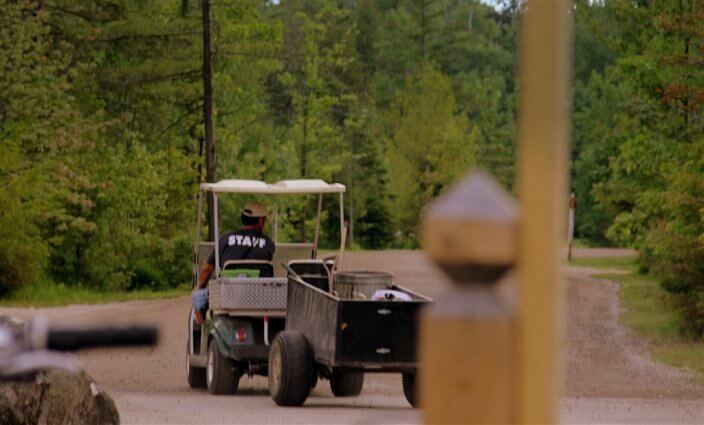 They come to and work at Mackinaw Mill Creek Camping, because they love the place, the campers, and the work. Their smiles and great attitudes are contagious! 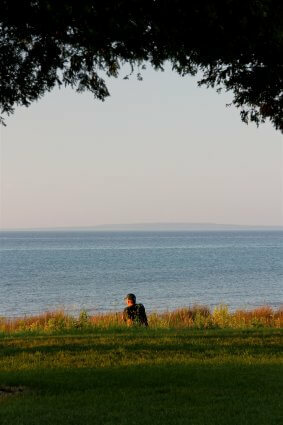 A camper enjoys some well-earned solitude along Mackinaw Mill Creek Camping's mile-long shoreline. 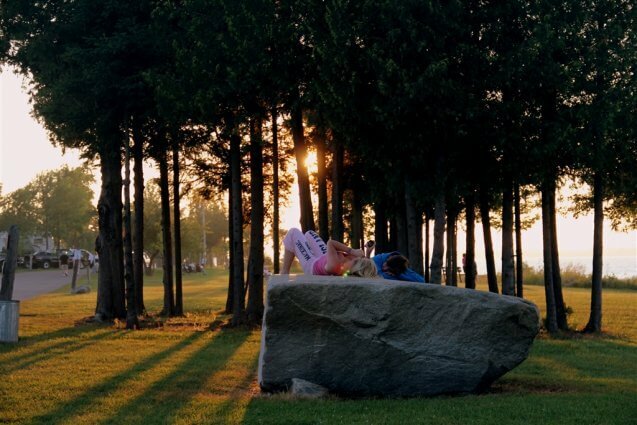 Campers seeking a solitary camping experience should book their stay anytime from May 1st through the middle of June, or after Labor Day weekend. Those dates offer the widest selection of sites with the fewest number of campers. Okay, this picture is just "cute." 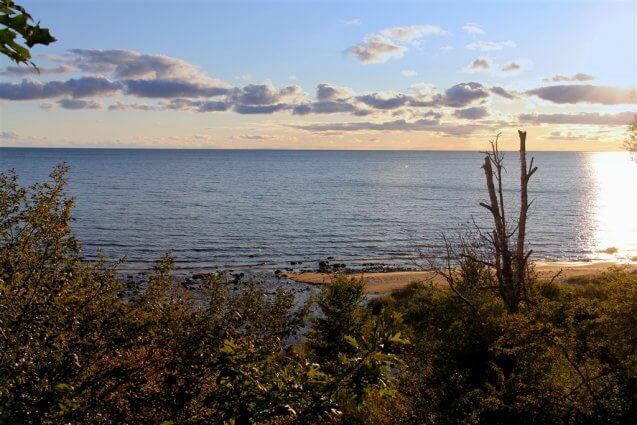 The incredible view from Mackinaw Mill Creek Camping is probably one of the most photographed locations in the state of Michigan. Rather than reading your morning paper at the kitchen table, why not do it, as some of our guests do, in full view of one of the wonders of the modern world, the Mackinac Bridge! The sun sets as these children perch on top of one of the glacially deposited huge boulders on the lakeshore of Mackinaw Mill Creek Camping. 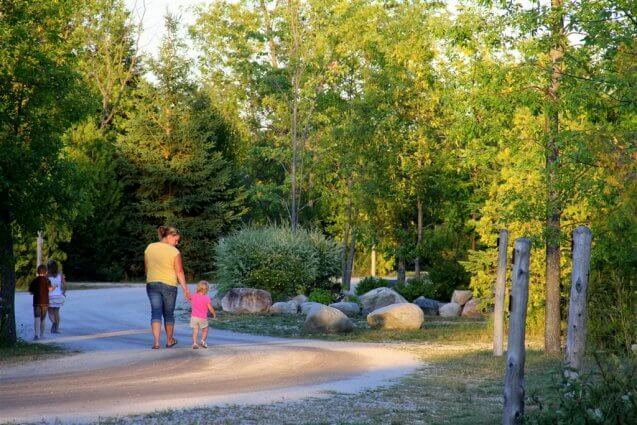 One of the reasons families enjoy coming to Mackinaw Mill Creek Camping is because of the spectacular natural setting. 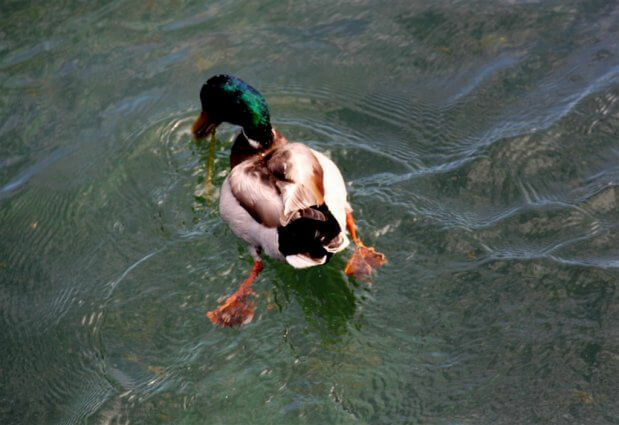 Many species of wildlife, amphibians, and waterfowl are in evidence everywhere. 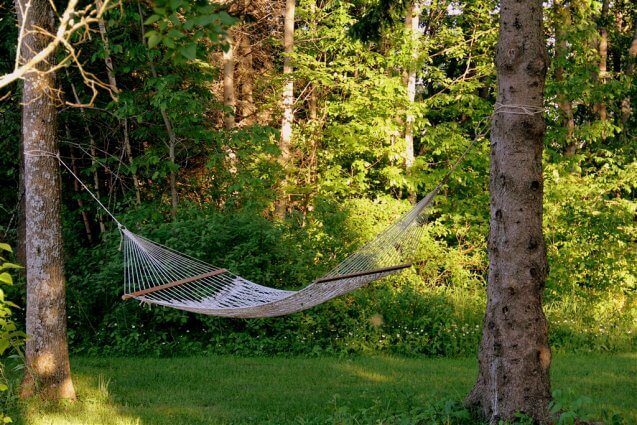 This is the hammock of one of our Mackinaw Mill Creek Camping workampers, and wouldn't you just like an hour or two with a good book in it right about now? 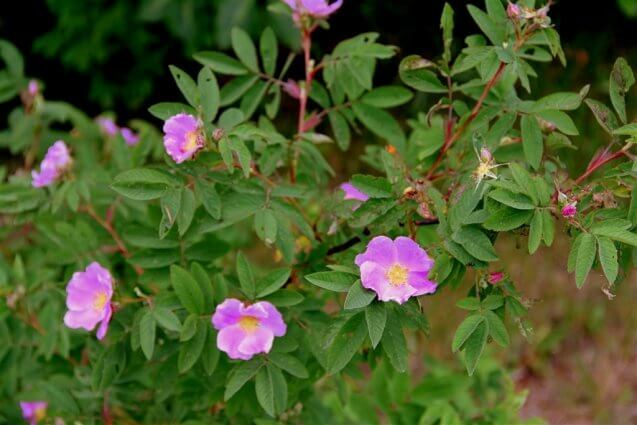 Wildflowers, like these wild roses, are in evidence all through the campground as well in the surrounding state wilderness that surrounds the park. 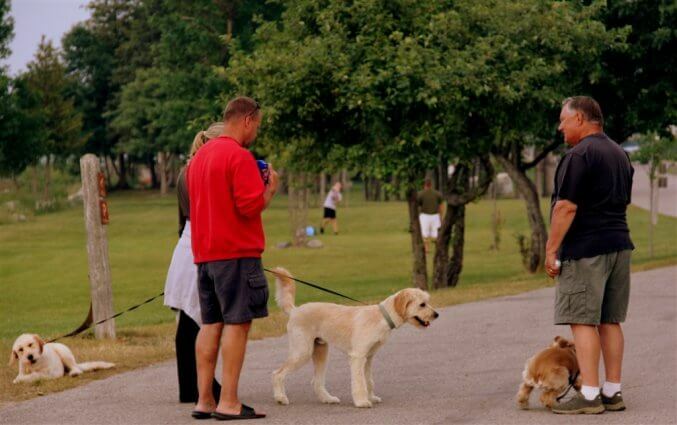 Pet friendly, kid friendly, and big RV friendly only begins to describe Mackinaw Mill Creek Camping. Who needs an Xbox when you have all of this fresh Lake Huron beach sand! 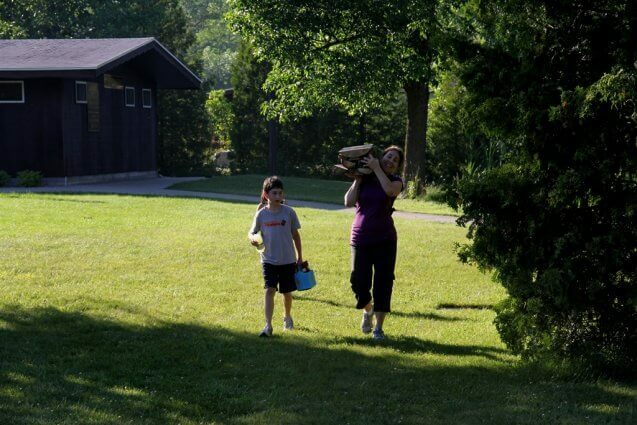 Mackinaw Mill Creek Camping's staff are never far away and always ready to lend a hand. Just look for smile on their face and the shirts that say "staff." Twisted cedars make a natural bench for campers enjoying the view from the shore at Mackinaw Mill Creek Camping. Children enjoying the original playground equipment created by the man who built much of Mackinaw Mill Creek Camping, Richard Rogala, whose family still operates the park today. This young lady, Makayla, and the little dog, Charlie, are strolling on what is historically known as Cadottes Point. You can see Mackinac Island in the background. From historical records we know that there was a French commander whose name was Cadotte, who was the commandant of France's Soo Sault Marie, MI post. 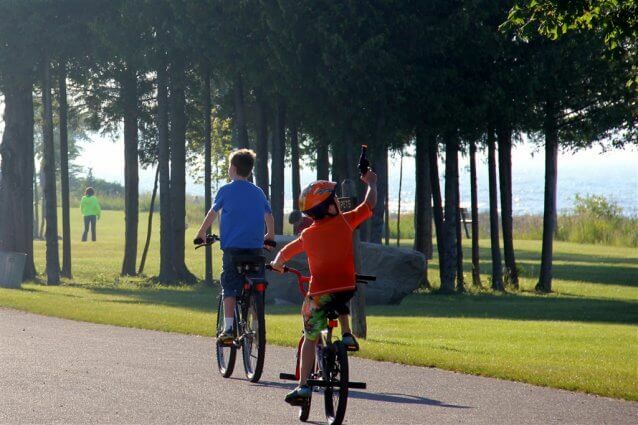 These lucky guys are enjoying a warm August day riding bikes on the miles of roads and trails inside of Mackinaw Mill Creek Camping. 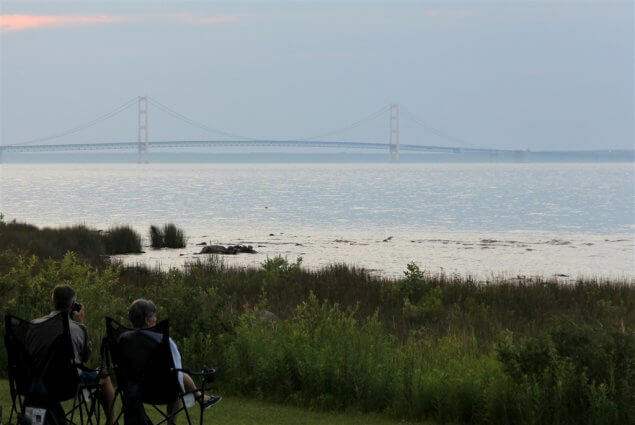 This group of Mackinaw Mill Creek Camping guests are taking in the view of the Mackinac Bridge on the same spot where you saw the wedding occurring earlier in this slideshow. 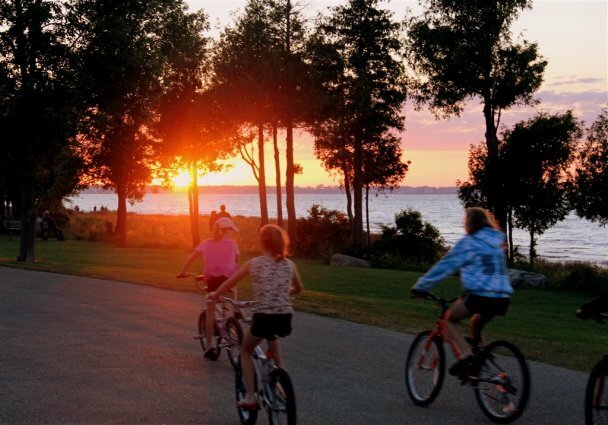 The sun setting behind these campers obscures the view of Mackinaw City, as they ride along the lakeshore of Mackinaw Mill Creek Camping. Mackinaw Mill Creek Camping campsite sits vacant in the August afternoon sun. 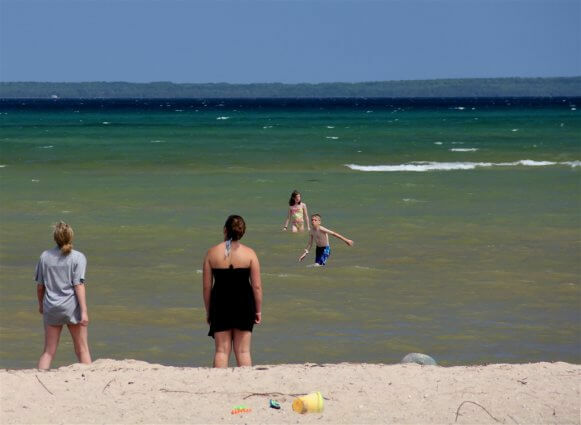 These campers are enjoying a breezy July day on the sandy natural beach at Mackinaw Mill Creek Camping. These Mackinaw Mill Creek Camping campers are participating in the pastime as old as mankind - looking for stones to skip on the lake. What better place to skip rocks then in view of the majestic Mackinac Bridge? 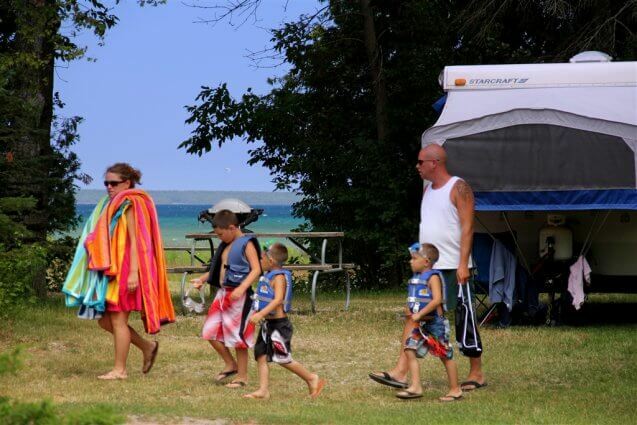 It's easy to understand why extended families come together for family reunions at Mackinaw Mill Creek Camping. 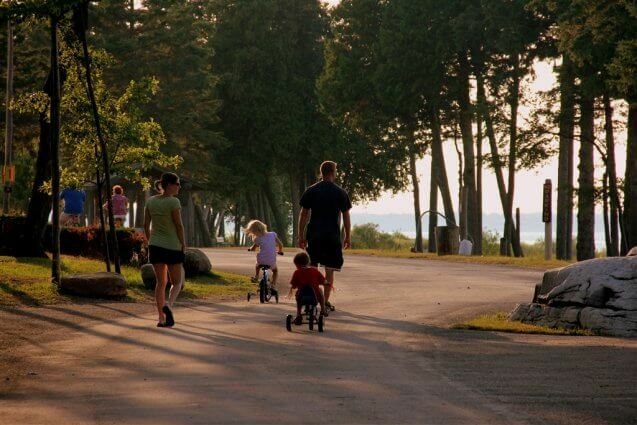 Here we see a family, some with bikes, some walking and active, some resting, but all enjoying the shoreline at the campground. 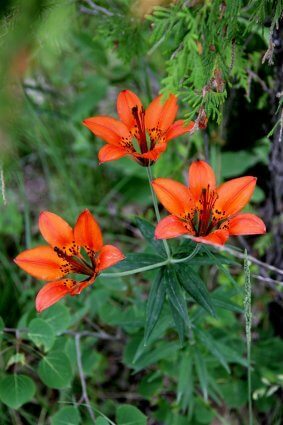 Wild Tiger Lillies are among the many species of wildflowers found on the grounds of Mackinaw Mill Creek Camping. 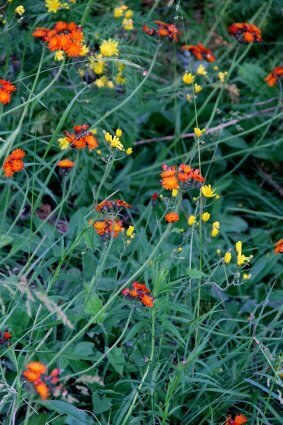 Experienced campers know not to disturb the natural wildflowers so that they will be around for next year's campers to enjoy. 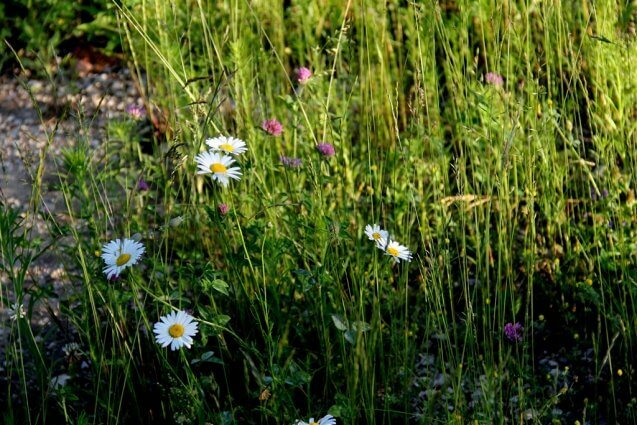 Here we see wild white daisies and flowering clover rolling along one of the foot trails located in Mackinaw Mill Creek Camping. 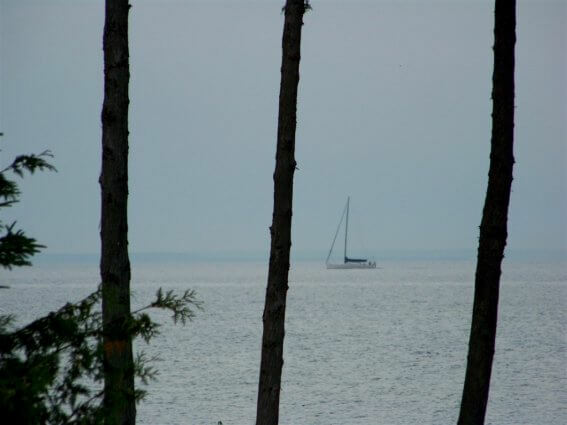 A lone sailboat passes the shoreline of Mackinaw Mill Creek Camping. 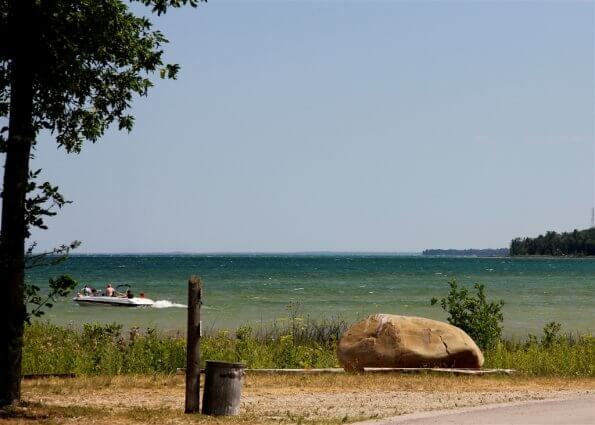 Guests at the camp regularly view lake and oceangoing freighters, pleasure craft and sail boats of all sizes. On May 7 of 1965, in Lake Huron, approximately 1/2 way between Mackinaw Mill Creek Camping and Mackinac Island, the SS Cedarville collided with the Norwegian ship SS Topdalsfjord and sunk, ten of the 35 sailors aboard perished. 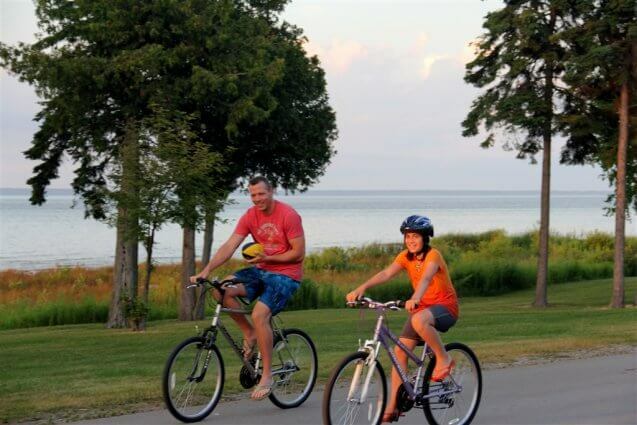 Active families enjoy many choices of activities at Mackinaw Mill Creek Camping. 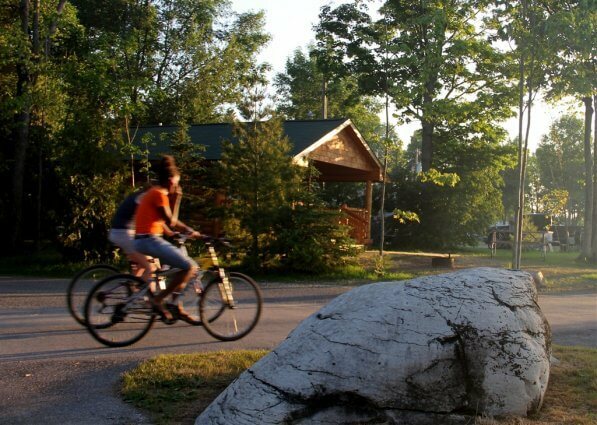 Swimming, hiking, fishing, volleyball, and biking are only a few of the many ways that active families spend their time at the camp. A jet skier passes in front of Mackinaw Mill Creek Camping's concrete boat launch. 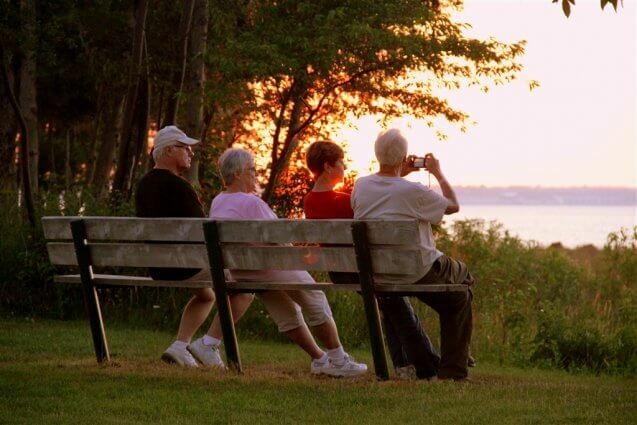 In recent years, due to falling lake levels, our boat launch has been only used by guests strolling out to enjoy the lake and fresh northern Michigan air. In the past season lake levels returned to a height that allowed for the launching of some small craft such as jet skis. 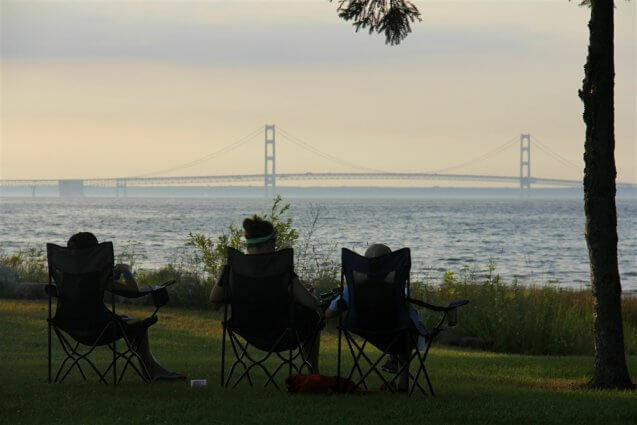 Campers enjoy the spectacular view of the Mackinac Bridge from the shore of Mackinaw Mill Creek Camping. 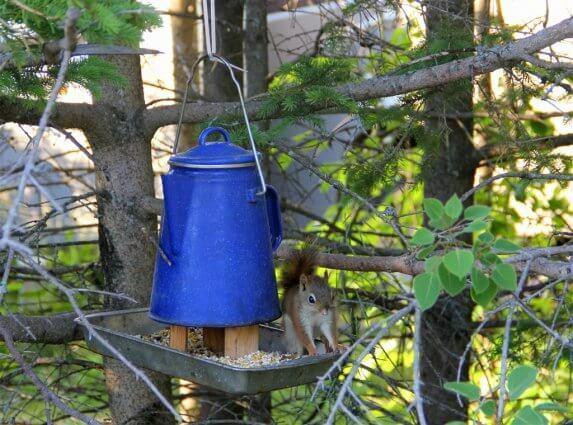 Mackinaw Mill Creek Camping workkampers (permanent campers who work at our camp in the summer and then travel to other parks to work during the winter) set up this bird/squirrel feeder. Here a boy, Devin, photographs seagulls, near the sandy beach at Mackinaw Mill Creek Camping. A flower from an ancient garden? The campground is situated on an old fishing village, remnants of which were discovered while building the campground. 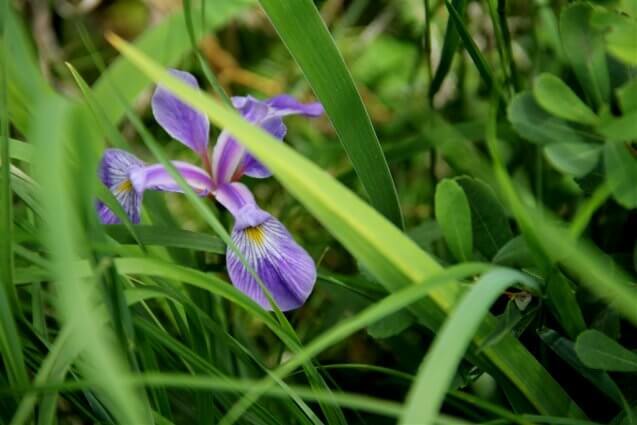 Remnants from the gardens of the extinct village's residents such as this iris pop up from time to time. A male Mallard Duck feeds near the shore of Mackinaw Mill Creek Camping. Wildlife enthusiasts have many opportunities to see migrating birds and indigenous plants and animals all around their campsites. Canadian geese along with many other species of indigenous water fowl can be found in Mackinaw Mill Creek Camping's wetland/bay. 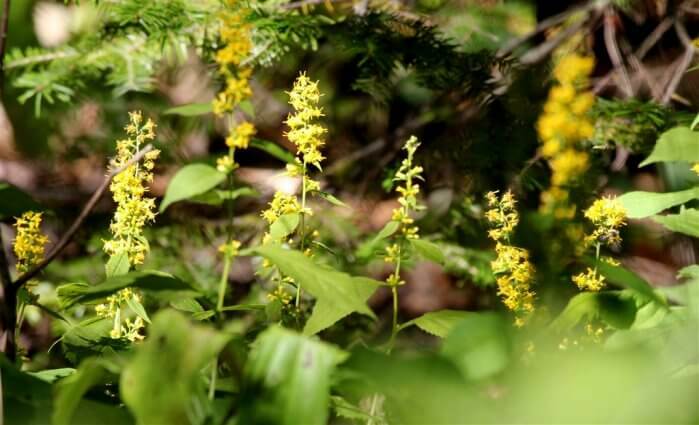 Summer wildflowers of Northern Michigan can be found along the trails and roads of Mackinaw Mill Creek Camping. This crusty old snapping turtle measured about a foot and a half across his back. 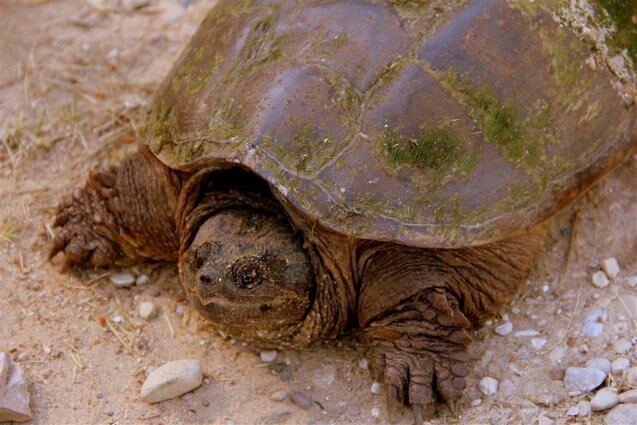 Nothing to be trifled with, if you or your children see one of these turtles give it a wide berth. Their snapping jaws can lock and are very powerful. 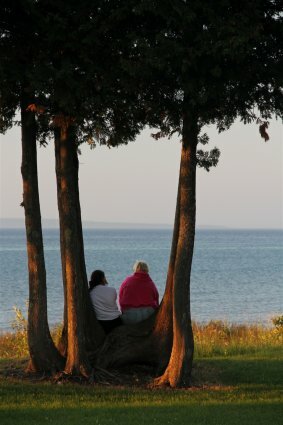 Campers at Mackinaw Mill Creek Camping enjoy a beautiful late August at sunset. 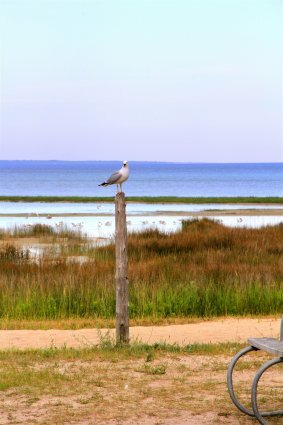 A sassy gull sits atop a post on the shore of Mackinaw Mill Creek Camping. Campers are advised not to feed seagulls, as they can become surprisingly aggressive. We have seen seagulls flock to and destroy campsites where food was carelessly left exposed. Under no circumstances should guests feed any wildlife that they see in the park. Very few foods and even fewer snack foods that humans typically eat are good for birds or animals. 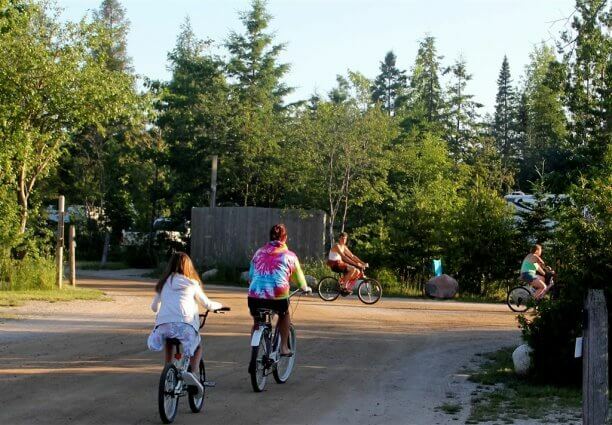 This photo shows campers biking near the large RV area of Mackinaw Mill Creek Camping. 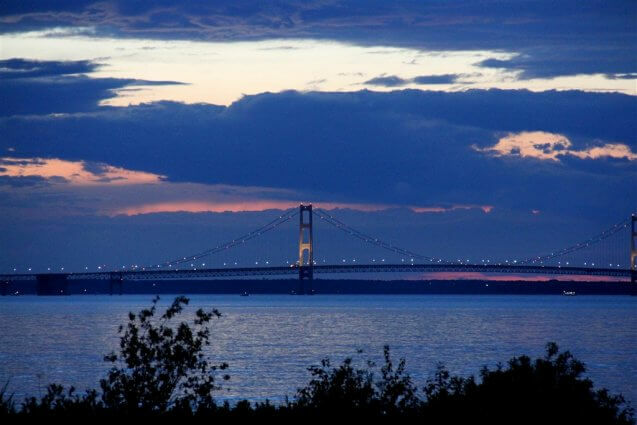 Campers enjoy the view of the Mackinac Bridge in the twilight after a beautiful sunset on the Straits of Mackinac. 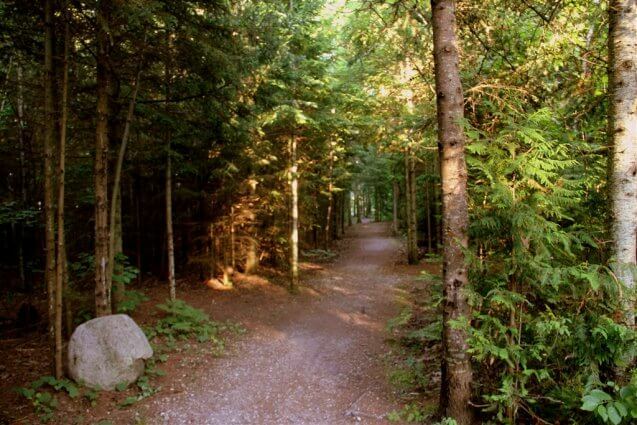 This is an entrance to one of the hiking trails at Mackinaw Mill Creek Camping. 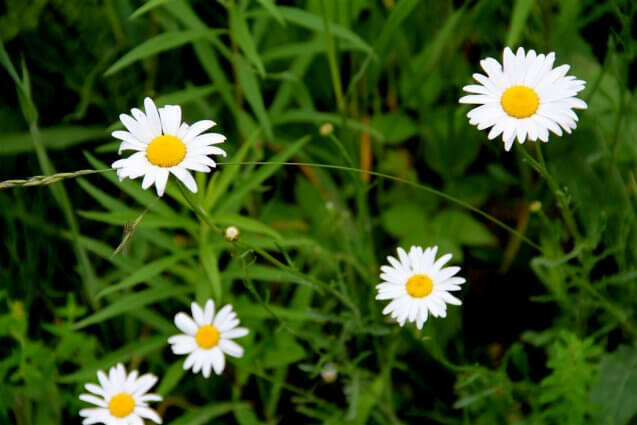 This is a close-up of wild white daisies which are among the many species of indigenous wildflowers that exhibit themselves during the summer months at Mackinaw Mill Creek Camping. Wildlife abounds in and around the campground. 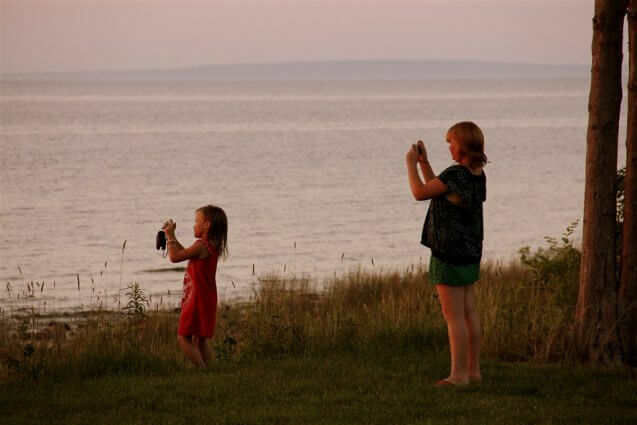 Campers at Mackinaw Mill Creek Camping enjoy reconnecting with the beauty of nature. Another spectacular northern Michigan sunset sets over Mackinaw City as these guest of Mackinaw Mill Creek Camping watch and enjoy. 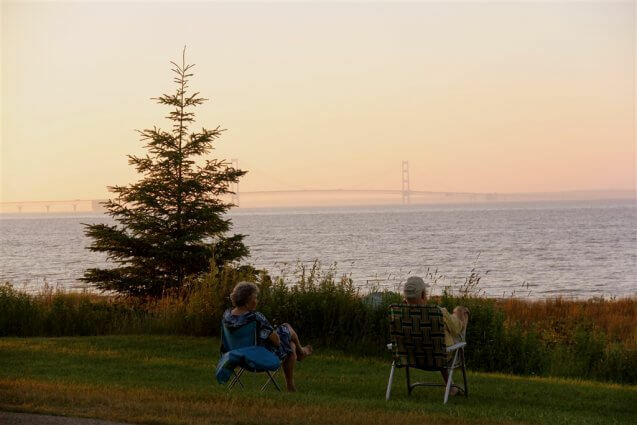 It is quite common to see guests of Mackinaw Mill Creek Camping leave their site and set up folding chairs on the lakeshore to watch the boats crossing and the sun set. 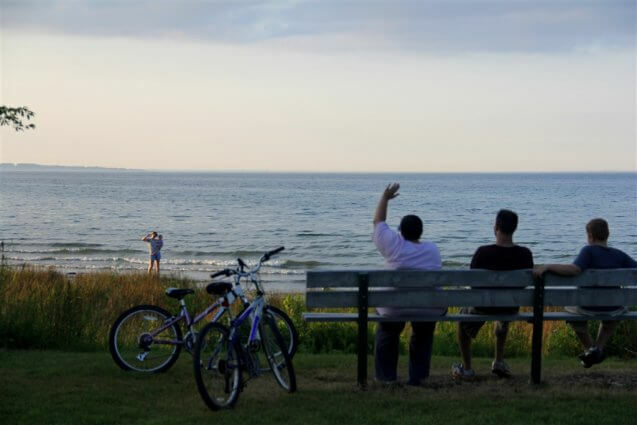 Since much of the lakeshore has been left as an open green area for everyone to share, everything from impromptu volleyball and football games to campers sitting in quiet reflection occurs along the shores of Mackinaw Mill Creek Camping. A proud stand of Queen Anne's Lace graces one of the foot trails at Mackinaw Mill Creek Camping in late August/September. 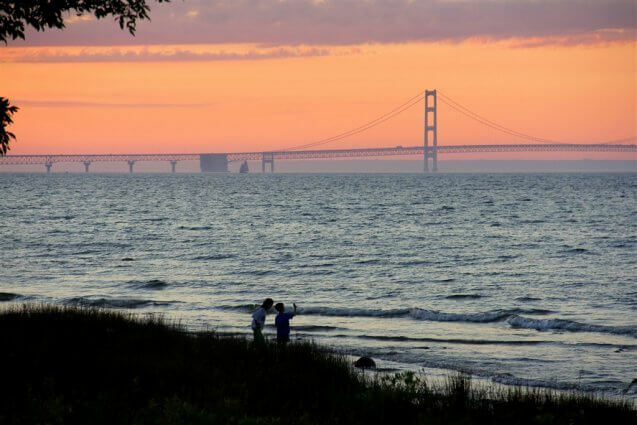 Many guests of Mackinaw Mill Creek Camping are surprised to learn that more structure of the Mackinac Bridge lies beneath the water then above the water. 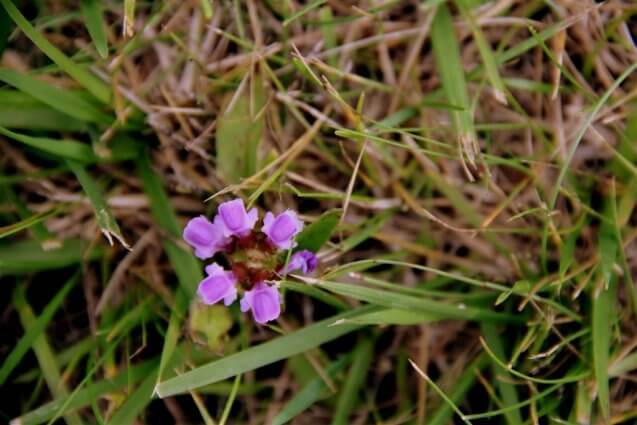 Many of the most interesting wildflowers at Mackinaw Mill Creek Camping can be extremely small, for instance this tiny flower was less than a quarter of an inch across. 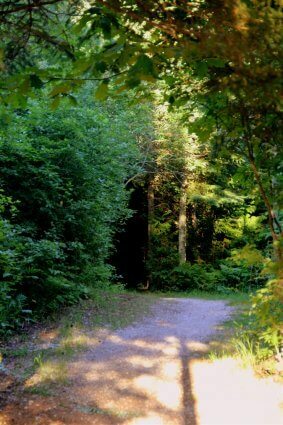 An entrance to a beautiful scenic foot trail at Mackinaw Mill Creek Camping. 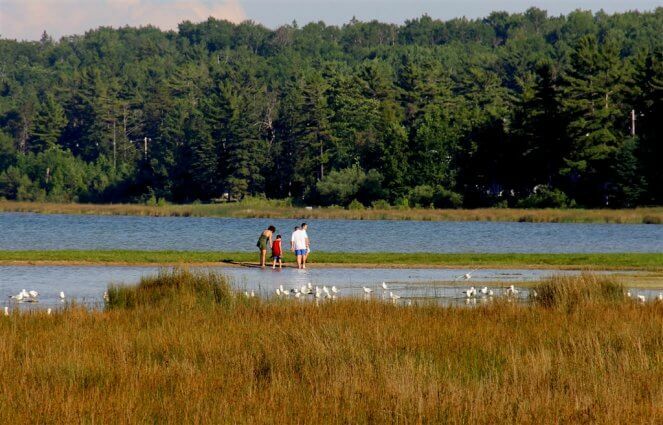 Miles of roads and trails and hundreds of acres of Northern Michigan wilderness give families many serene opportunities for family time together in this beautiful setting. 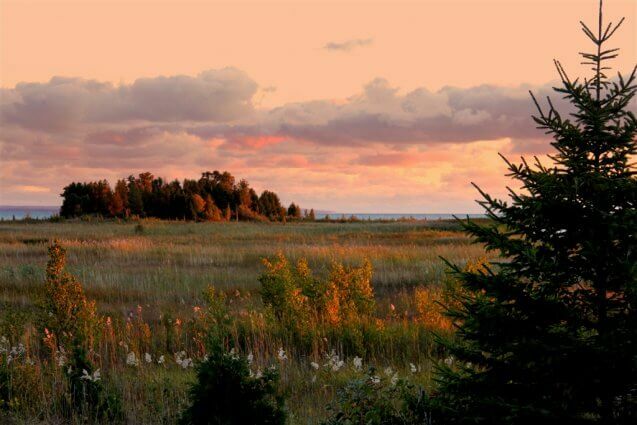 The ethereal twilight colors after sunset gives photographers camping at Mackinaw Mill Creek Camping many opportunities for incredible shots that will wow their family and friends. A hiking trail at Mackinaw Mill Creek Camping at sunset. 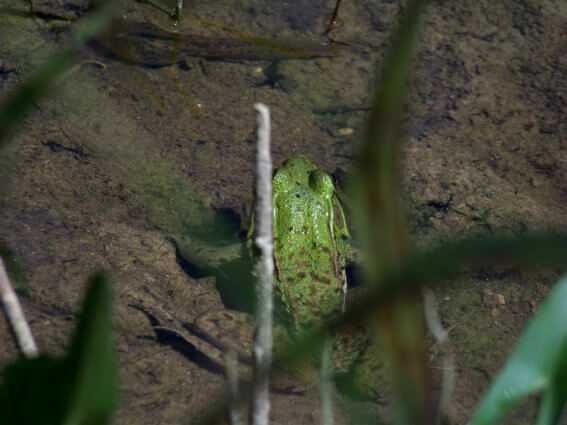 The wetlands of Northern Michigan and Mackinaw Mill Creek Camping are one of the few places where amphibians still abound in healthy numbers. 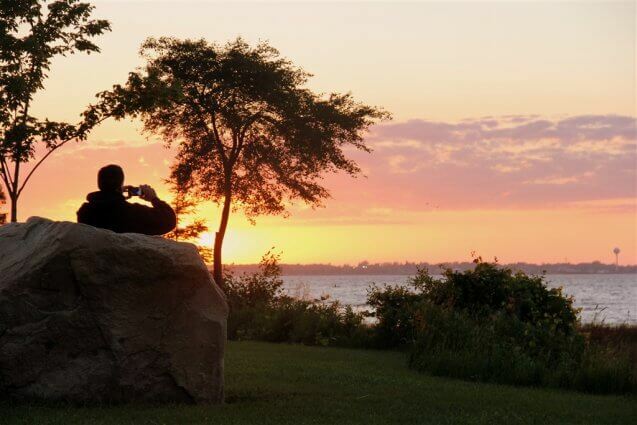 A camper sits on a rock in Mackinaw Mill Creek Camping, in quiet reflection as the sun sets in the west over Mackinaw City. We had a wonderful time at your beautiful campgrounds. We hope to come back soon. We will highly recommend you to all our camping friends and to all others! Thank you!